This is a blog I’ve been meaning to right for a while. Australian culture is not too different to that of the UK, they have a similar education system, speak english and even drive on the same side of the road. The main difference is the sun; there is a lot more of it. This lends itself, to an increased interest in outdoor activities, from running, surfing, paddle boarding and many other physical activities, also leading to an increased promotion of a ‘healthy lifestyle’. There are increased trend towards begin vegetarian or vegan, become gluten and lactose free and many shops and cafes are targeting this particular niche market, which doesn’t surprised given the active nature of the people. With the good weather, come increased exercise and this is not a bad thing. People can go and be social outside in parks, at the beach, by the bays, meaning you quite easily gain a network of friends. The nightlife culture focusses more of bars than it does clubs, with many of them closing around 12 or 1am. This was actually refreshing sometimes, as you could still go out and have a good time, but be in bed by 12 and get a decent night sleep. Academic life differs in its approach to study. More emphasis is put on study, with many units opting for a more coursework heavy approach, meaning that more work is required throughout the semester, unlike Manchester (and other English universities), where exams form the core of the unit. 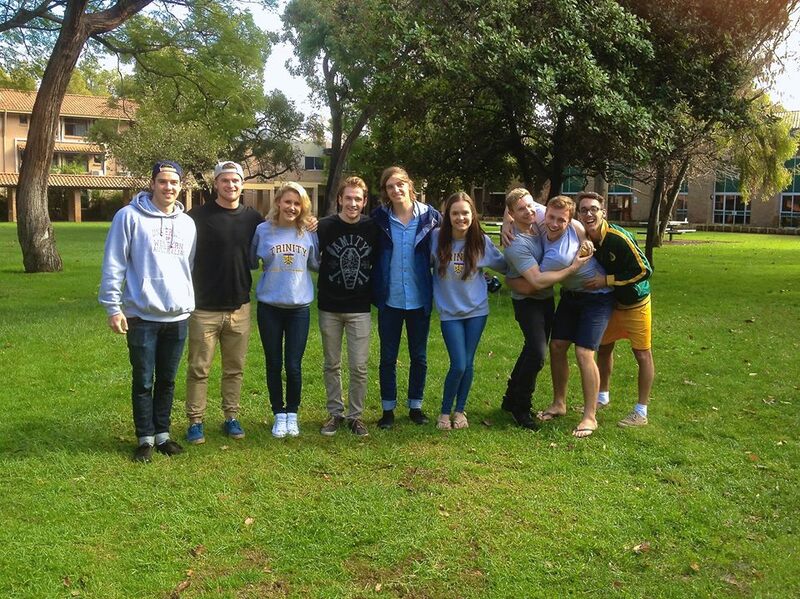 There is also more freedom within the course structure, particularly at the University of Western Australia, where there are many broadening units that a student must undertake in order to be able to graduate. I wrote a similar piece on this back in November. University sports has a completely different structure to that in the UK, especially in Western Australia. With the city being so isolated, and only around 5 other university in the surrounding area, the sports network is nowhere near as vast as the UK. Every year there is a big tournament, the UNIGAMES, held in the Gold Coast, where thousands of trained athletes compete to bring home the title. They do however has many social leagues, like in Manchester, were you can play anything from Netball to ultimate frisky, which is fun but also taken quite seriously. However on the flip side, upon my arrival within Australia, it has been noted that aboriginal culture, whilst celebrated in minor part, has generally been overlooked and misrepresented, especially here in Western Australia. Merely observing my surroundings walking around Perth city, you note the number of homeless aboriginal people in comparison to ‘white’ Australians. To me, it seems that aboriginal people are targeted, especially by local authorities as being a ‘menace’ and a ‘nuisance’, with many on the streets being stopped and searched for stolen goods. Whilst yes some are found guilty of shop lifting, not all are out to cause trouble. Police patrol the streets of Perth city daily, making sure there is no trouble and you often see groups of officers approaching groups of aboriginal people. Im not saying that the police are being discriminatory to indigenous people purposefully, these are merely observation that i have witnessed during my time in Perth. I have friends here that are studying law and politics and they tell me that, there is so little academic literature regarding the treatment of indigenous people within the country, that they struggled to right essays that were focussing upon indigenous culture. What saddens me is that the UK and British rule is in some part to blame. Early settlers to the country were captains and solders, bound on ships towards the Western Coast, invaded indigenous lands. The tribes values and morals have been in some part forgotten, and many indigenous people have been forced out of there native lands. Discrimination towards Aboriginal culture comes in all forms. There have been many recent articles over the Australian love of ‘Blackface’; The use of makeup, typically in a white person to represent that of black person. I intended to partake in a Indigenous studies unit this semester, however due to timetable clashes it was not possible, but it is definitely something i would love to look into more. Drugs have become an issue within this community of people, with Crystal Meth use becoming a major concern. But it is also a country wide concern. Drug and alcohol abuse is one of the biggest killers in Australia and cost the health turn millions each year. Many TV campaigns are actively trying to reduce the number of underage people turning to drugs and alcohol in order to try and contain the situation. Other drug related problems are linked to increased steroid use. As mentioned previously Australians as a nation, i would consider to be much more active and with this comes steroid abuse, as a way of gaining muscle to look as physically fit as possible. There is still a long way to go however, as the problem has become so widespread, its going to take a while. Despite this, my experience in Perth was not dampened, discrimination happens in every country unfortunately, however efforts are being attempted to reduced the severity of the discrimination. Im going to apologise now as I’m about to spam you all with the blogs i have missed during this busy six months i have had. 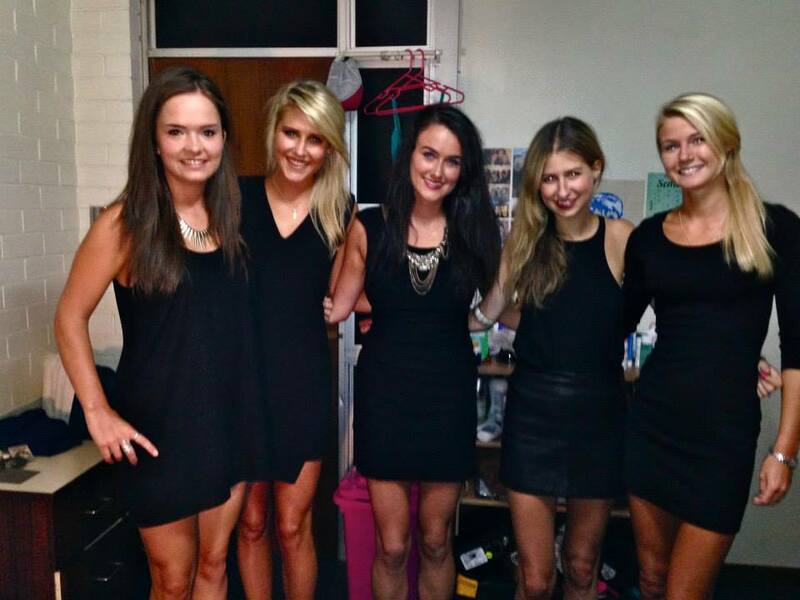 So this semester has been a hectic one and so this blog was a little neglected. My return back to Perth to begin the semester again came after a fun fuelled and hectic summer, road tripping the Australian east coast and New Zealand. It all started on the 27th November with the first flight to Cairns to begin my six weeks road trip down the East Coast of Australia. I always thought of Australia being so far away from home, but in reality the world is so connected now that its wasn’t long until I ended up meeting some people I knew from my home town, completely coincidentally in my hostel room. Its a small world! There I was joined by three other travelling buddies and we hired a car to begin our 22 day road trip trip to Byron bay. Our first major stop was Port Douglas, where our Great Barrier Reef tour commenced. As a place I’ve studied and learnt about throughout various years of senior school, university and you watch documentaries and read news about the reefs, its sometimes hard to believe that now i have actually experienced it. I opted for the snorkelling option, due to a tight budget, that was to last me until February. Whilst diving, some would say would be the preferred option, snorkelling was just as much of an experience, to swim around the reefs and corals is a magical experience. The fun and games didn’t stop there. After a week of travelling down the Eastern coast, we found ourselves upon a cruise ship, cruising around the Whitsunday islands. White sands and blue seas, it looks like the cover of a magazine, right now you feel like your in paradise. This all came before a mammoth 12 hour drive down to Hervey bay where island hopping seems to be a common theme this trip, ending up on Fraser Island, the worlds largest sand island, stretching around 120km in length. The tour brought us to Lake Mckenzie, a uniquely located closed lake system, one of a few in the world. In true Australian Style I knew i needed to try my hand at some surfing. My first surfing experience, saw me failing absolutely miserably to even stay on a board in Surfers Paradise, Gold Coast. After many attempts, i admitted defeat and stuck to the body board, where catching waves was no problem and gave me hours of fun. After hitting the Queensland beaches for the last , it was time to enter New South Wales. Nimbin, how do i describe you? Whilst those who have heard about the place will know exactly what I’m about to say about it, but for though who don’t, here goes. Nimbin is notorious for its Cannabis culture and has a very free living environment, with a significant hippie look and feel. It has become known for being the ‘drug capital in Australia’ and its not every day you have the Hemp embassy next door to the police station. After exploring this region, we made our way down to Byron Bay. Byron bay was where the fun really started. As we waved goodbye to two of our fellow traveling companions, it was me and Alice left. As many can imagine there is a typical sense of people coming to Byron bay to ‘find themselves’. 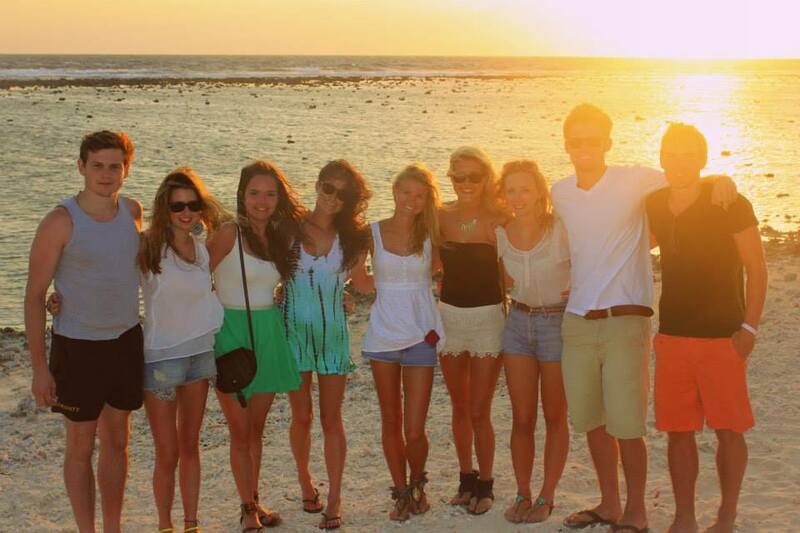 The place is full of British and European backpackers coming to live the ‘Australian dream’. 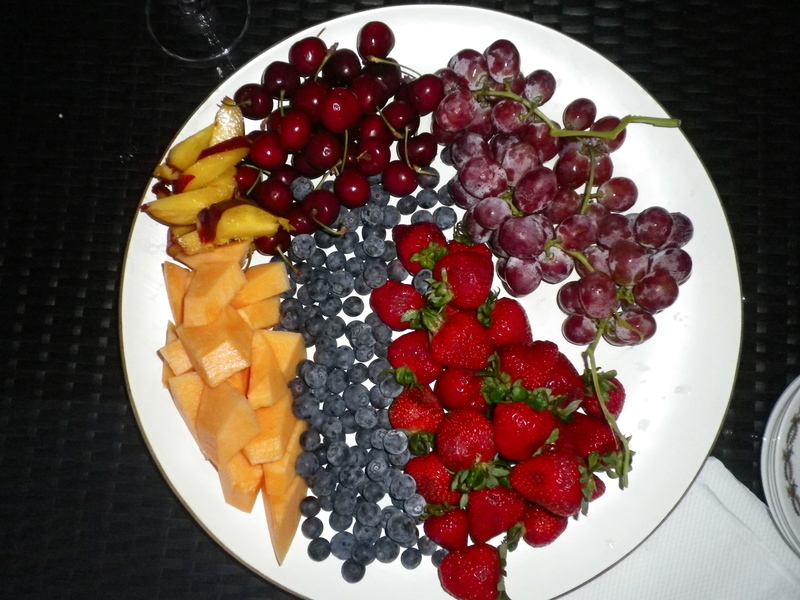 Unfortunately it wasn’t all fun and games, as I ended up with severely tonsillitis spanning the whole of the Christmas period, which left me unable to eat and eventually in hospital, where a minor surgery had to take place. Christmas day also happened to be the wettest day on record for Byron, in over 30 years! Just our luck! Not all was bad though, the evening of the 25th eventually brightened up and so a trip to the beach was on the cards. Santa hats and secret santa gifts in tow, we had a lovely evening, with some drinks and classic beach games, to take us into the night. From Byron we took short flight to Sydney, to prepare ourselves for our New years celebrations. 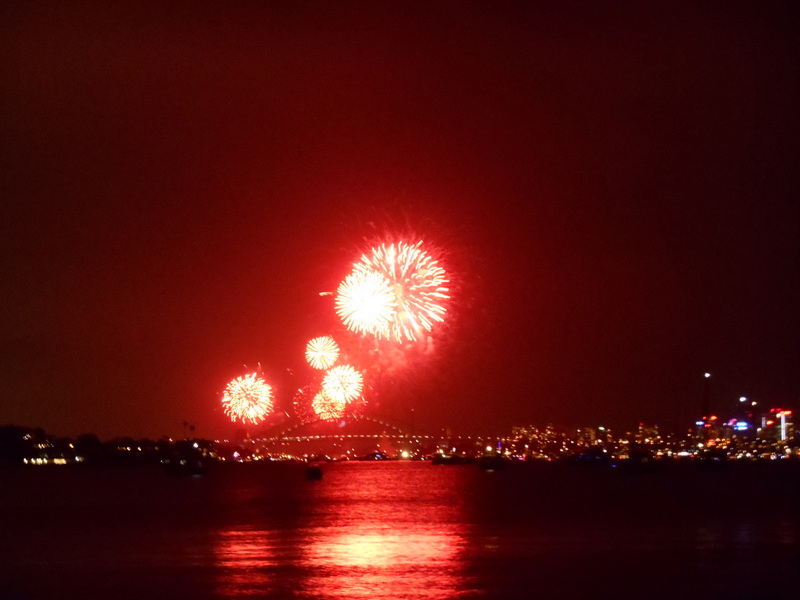 We hit pot luck and managed to hire an apartment that had some spectacular views of Sydney harbour and a perfect viewing platform for the Fireworks that were to take place. With a group of around 9 of us, all UK exchange students, from various universities, it was a lovely way to bring in the new year, with a few drinks and a BBQ in the park, overlooking the Opera house and Harbour bridge. After 42 days, my journey ended in Melbourne. Of all the Australian cities, this has to be my favourite. Personally, It has a vibe similar to that of many english cities, such as London and has a very welcoming feel, something that Sydney lacked. This period of time was a respite for me to prepare myself for my New Zealand adventure that was fast approaching. 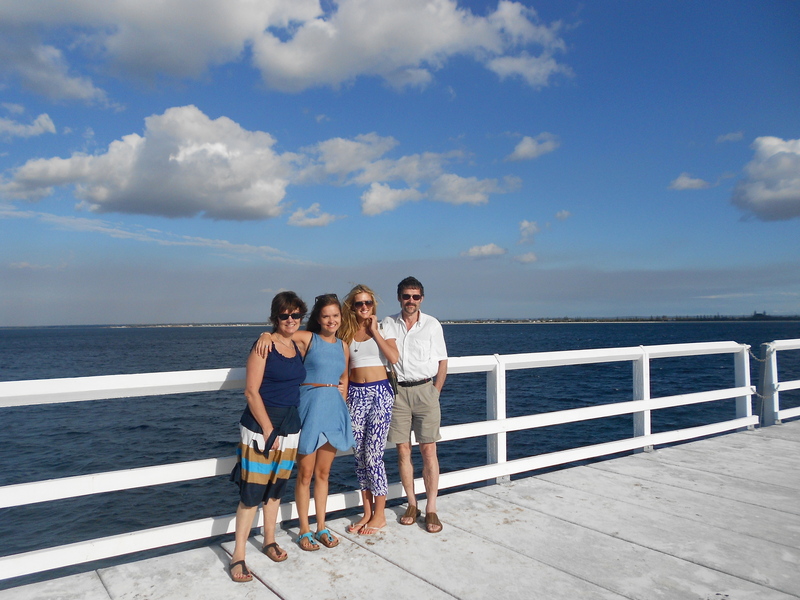 Its been nearly two months now since I arrived in Perth, so this blog is long overdue. Since my arrival here, its been non stop fun and games, that even includes the uni work! So many new people and faces to learn, from your home of residence to the multitude of different units undertaken. Living in Trinity college was probably the best decision I’ve made. For me being a fairly social character, the chit chat is endless, I have to force myself to go and do some work otherwise i would literally spend my days socializing on the college grounds. It doesn’t help that Anni (resident mum) has just bought a new puppy….. she’s so small and cute. I can’t believe how quickly the time is going. In a few days time i will have been here 2 months, thats the longest amount of time I’ve every spent out of my home country. Ill tell you what though, its probably its definitely the life for me. Everybody is so relaxed and easy to get along with and everybody wants to know how your doing and what you’ve been up to since you’ve been here. The only downside to my experience is that the workload is weighted very differently here then back in Manchester. With Perth (and Australia generally) I thought that the universities may follow similar workloads, but this is not true. Here there is much more focus on assignments. In first semester alone I have 12 assignments most weighted at around 30% or more. Group work is also much more prevalent here. From speaking to other internationals and exchangers, they agree, with a lot more of there marks being participation marks. Another thing I’ve had to adjust to… 8am lectures! However despite this, the campus is so beautiful and full of life. 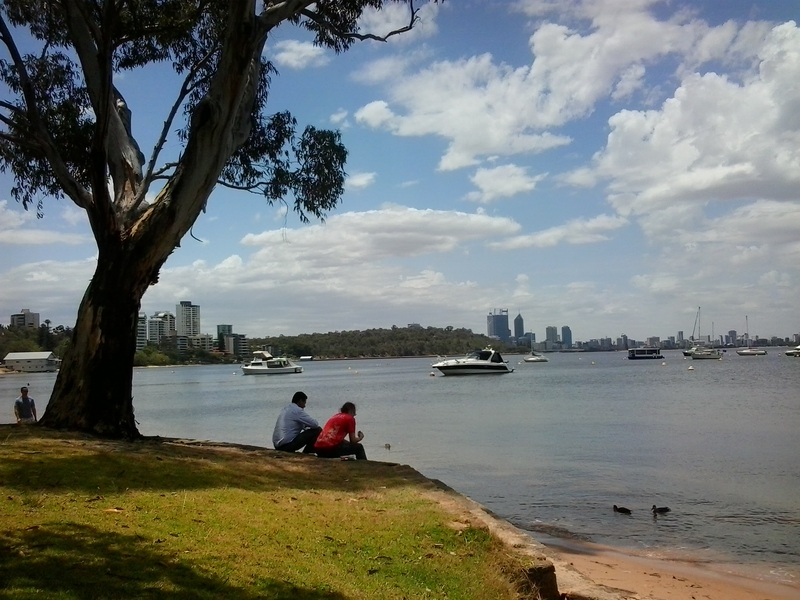 It over looks Swan River and Matilda Bay, where dolphins can be seen (if you get you early enough). This softens those 8 am lectures and makes it more worth while. Despite the workloads I’m still finding the time to explore Australia. 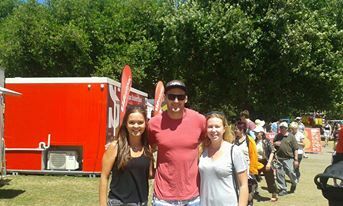 I recently attended an event called STUMPS. Nobody really knows what it stands for but it involves a car, your passengers and of course fancy dress. 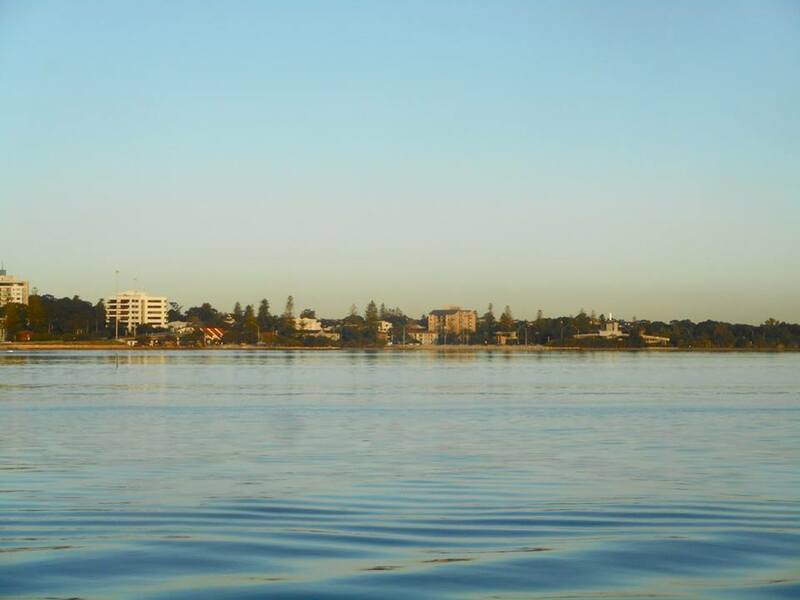 You basically have a series of challenges to complete around Perth and then your final challenge is to find the Party for the end of the night. 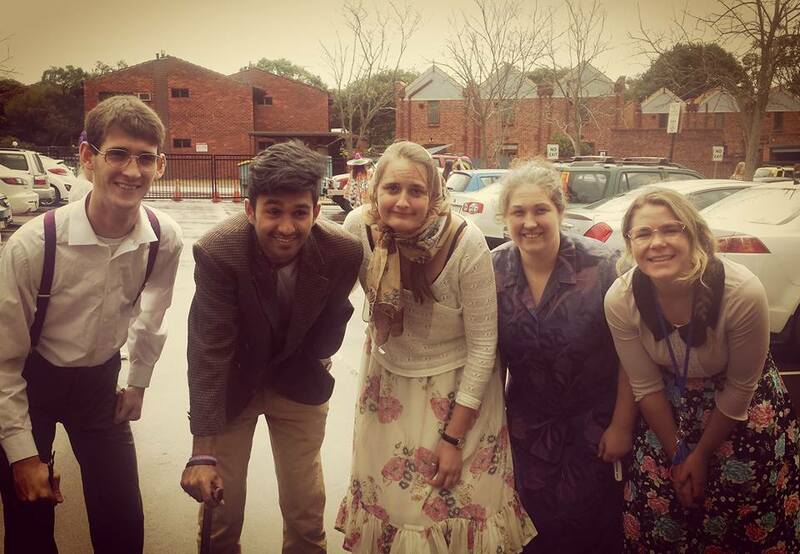 My car decided to go as old people, and we pulled it off that well some people actually thought that we were from a residential home and were lost on the campus…. no joke! And if I’m honest I agree I thought we looked fabulous. One thing, I’ve learnt since living here is that the opportunities I’ve had to travel to different countries across the world is priceless. Many people here would die for the chance to travel across Europe, even to southern Asia, that realistically isn’t that far from Australia in comparison. Even though Perth is considered one of the richest cities in the world, the wealth is disproportionately distributed and so many people just simply cannot afford it. You can see the excitement on their faces when you tell them where you’ve been, and many people aspire to many live in the UK one day, or travel through Europe for a fraction of the cost here. Anyway that’s me done for now. Ill try and post more regularly. Since uni ended the countdown to Australia began. The excitement braced me everyday. Everyone who knew I was off on this year long adventure asked the same question, ‘Are you excited?’, ‘Aren’t you lucky to be going on this adventure?’; I could only simply answer yes, with a beaming smile. I knew I was very lucky to have been given this opportunity to study abroad, all thanks to The University of Manchester. The night before the departure was tough saying bye to my parents, brother and nephews, knowing that when I returned the youngest one would have changed so much, but thankfully we can still Facetime and Skype. There was a lot of last-minute packing involved, deliberating over whether I really needed that extra jumper or pair of trousers and then the worrying if my bag was overweight. I used various methods to attempt to weigh the bag on a set of old school bathroom scales, which gave a different reading every time! My journey started at Manchester International Airport, where the excitement become all too real, I was actually going to Australia. I was flying with Qatar Airways going from Manchester to Doha, Doha to Perth with an overall flight time of just under 19 hours. Saying goodbye to my friends and family was sad, but I knew that the journey ahead of me was going to be worth it. 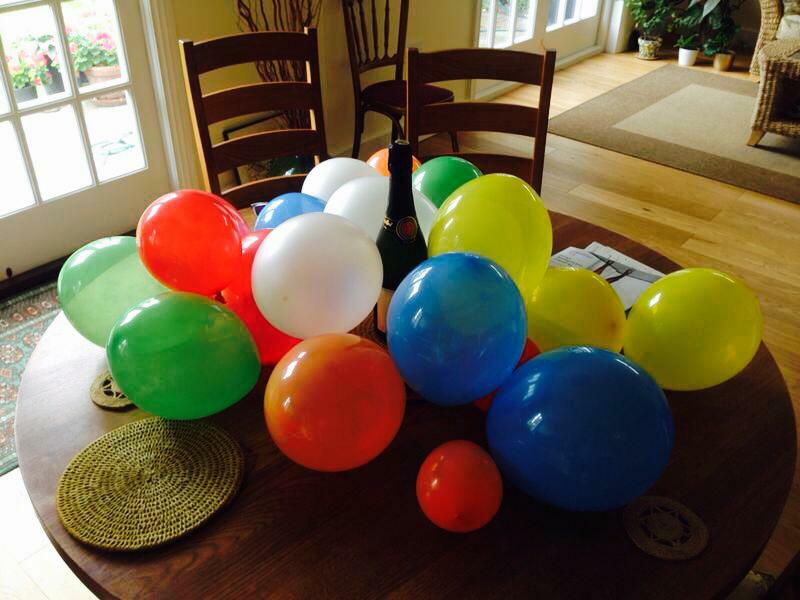 I checked in (suitcase underweight), said goodbye to my family and then I was off – this was it! 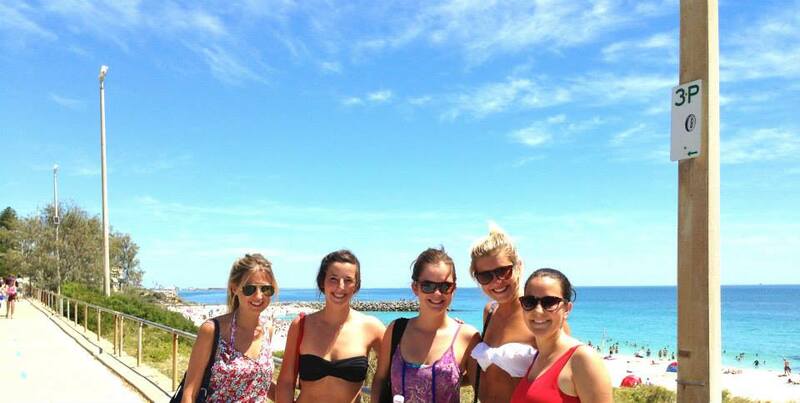 My first few days in Perth proved equally as hectic as my final weeks in England. 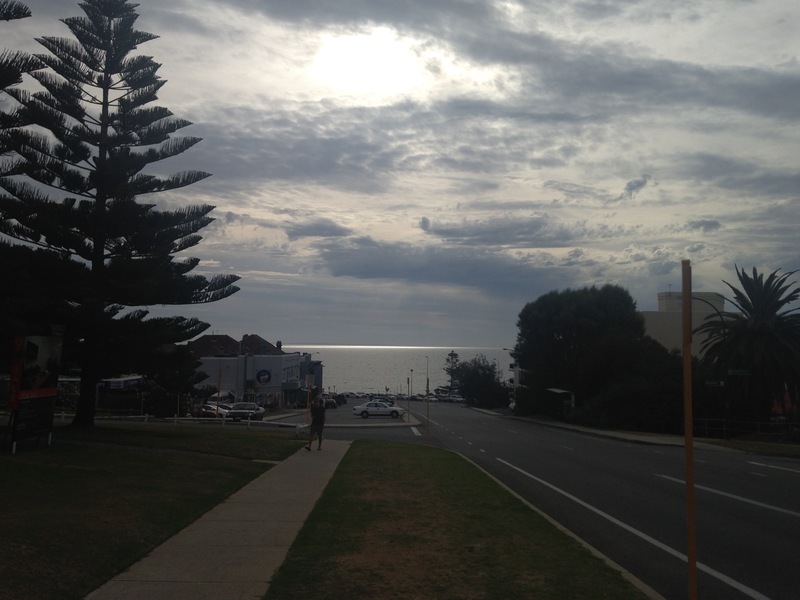 Having checked into the Ocean Beach Backpackers Hostel in Cottesloe, I was awestruck by the incredible views the beaches of East Perth offered. 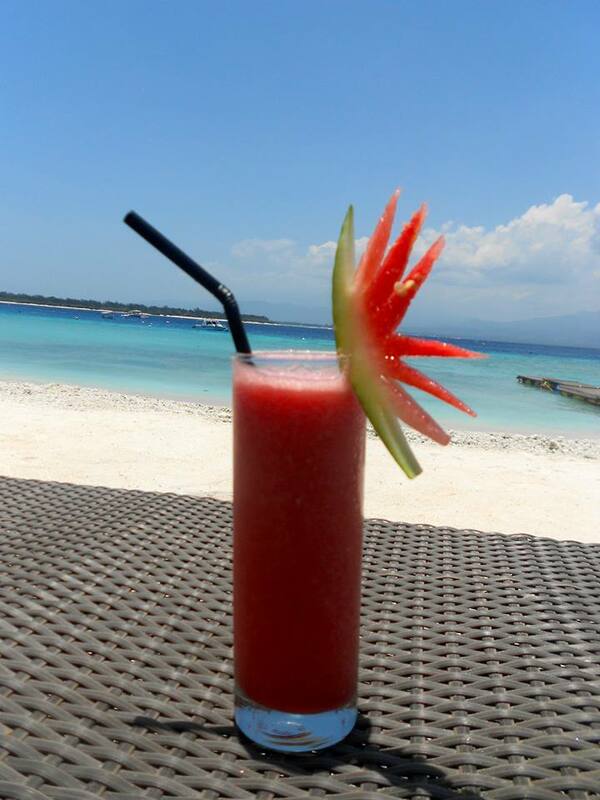 Following three days of recovering from jet lag (or relaxing with my fellow backpackers in paradise, to give a more honest appraisal), I had yet more issues to attend to. Setting up a bank account and buying an Australian phone proved simple tasks. 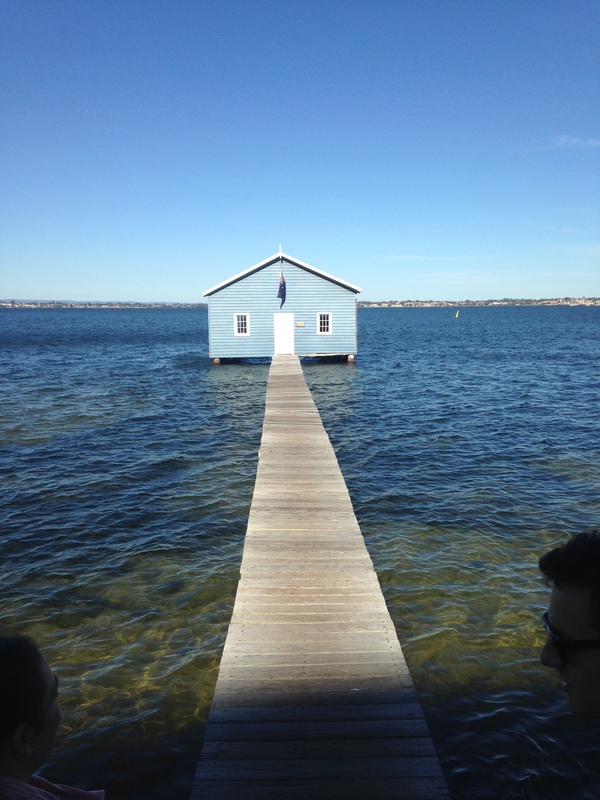 Following several unsuccessful house viewings in a variety of Perth’s less desirable suburbs, however, I realized that finding accommodation would be more difficult than I first anticipated. In desperation, I attended a housing advice lecture hosted in UWA: to my surprise, there were still some spaces available in university halls. Following several frantic phone calls, Beck, a lady who worked as part of the college staff, kindly picked me up from my hostel, gave me a personal tour of the hall and after a few minutes signing paper work I was officially part of St Thomas More College! I had arrived slightly late for O-Week (the Aussie equivalent of Fresher’s), but was still able to get the most out of my first few days in Tommy. 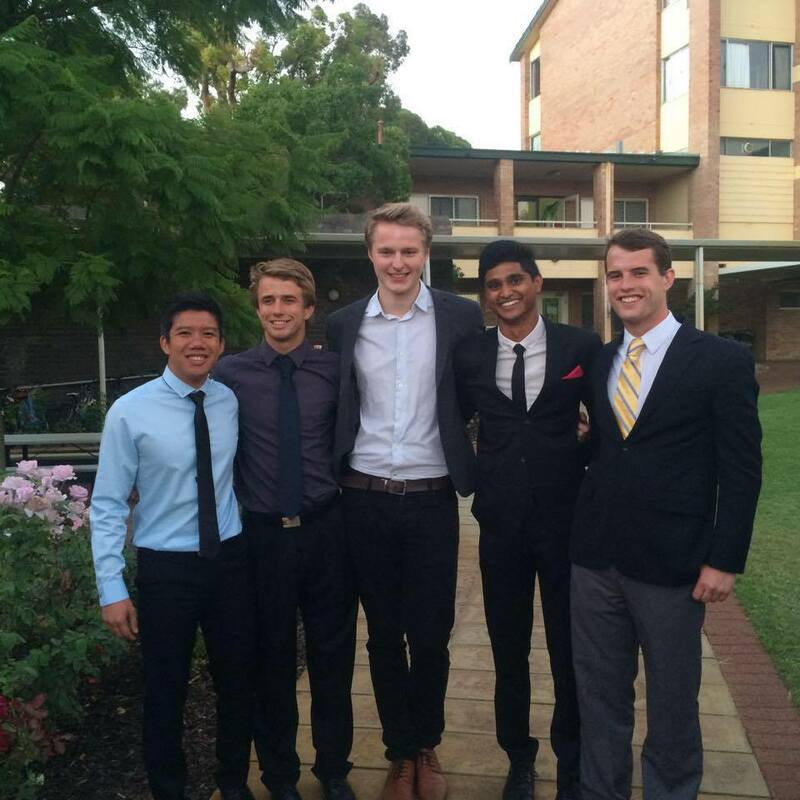 The variety of organized activities ranged from laser tag to casino nights, ensuring all the freshers were able to make friends easily, which truly helped to promote Tommy’s motto ‘Smallest College, Biggest Spirit’. Throughout the week we also practiced a college dance routine to Taylor Swift’s ‘Shake it off’ which was, to my surprise, suggested by the guys on college committee. The final day of our first week culminated in a college dance-off, where we pitted our moves against the other four UWA colleges on the stunning beaches of Perth city. The bay was a sea of blue and yellow as our 150-strong flash-mob got down to ‘This, sick, beat’, although our efforts were only rewarded with second place in the competition and the following Aussie beach ‘barby’. The competitive nature of our dance-off highlighted the hugely intense and simultaneously positive college rivalry within UWA, which is continued throughout the year by a plethora of inter-college sporting competitions, ranging from football (or soccer, as the Aussies incorrectly name it), to the slightly less serious ‘ultimate frisbee’ contest. The nature of college also created a strong impression upon me in my first few weeks, as it differed greatly to my experience of halls in first year. Firstly, several of my peers already knew each other from before college either because they had come to university with friends from their home town or had stayed in college in previous years. These older students mostly occupied positions on either the student committee or were residential advisors who ensured the well-being of students. 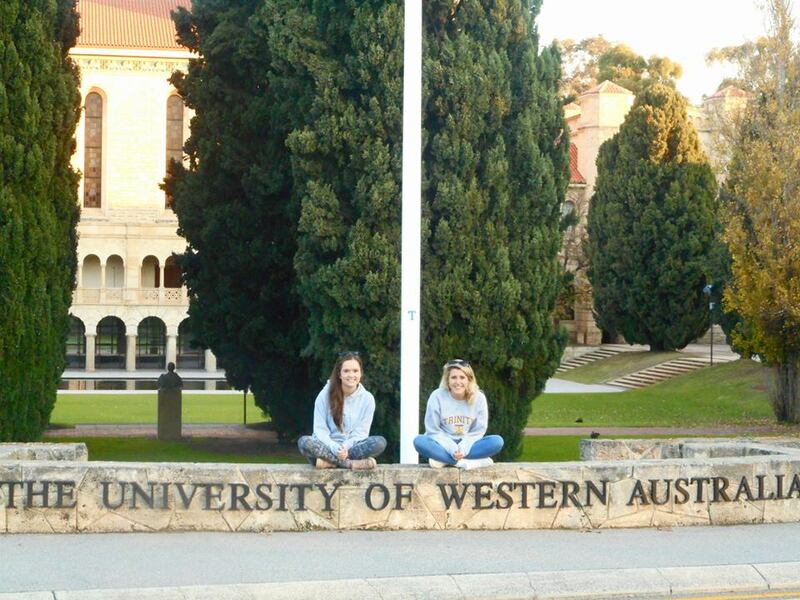 Additionally, a large proportion of students were not at UWA, but attended other universities in Perth such as Notre Dame or Curtin University, further adding to the diversity within our college. Furthermore, a large proportion of my fellow collegians were also completing international exchange programs, meaning there were fellow British international students, as well as European and American students. 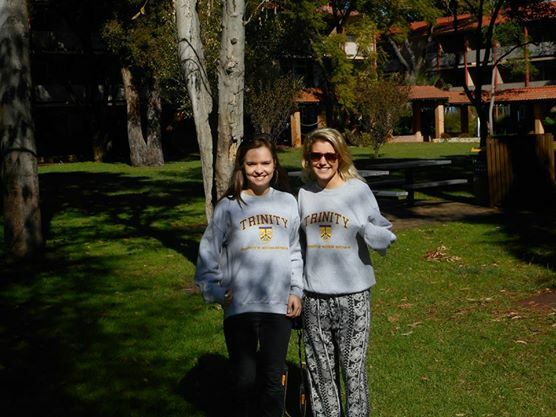 Although the induction week in college and make-up of the student body differed to what I expected based upon my experiences of the British university system, my first few weeks in college flew by in a blur of socializing and studying, as college life provided an unforgettable introduction to Australia. I came back to the UK in the middle of August, and after 13 months away from the UK, it was so surreal being home. My last six weeks in Sydney seem like a blur. I spent the time nannying for a 9 month old baby and exploring more of one of the Australian cities I have come to love. By the time my time in Sydney came to an end, I was ready to come home knowing that it hopefully won’t be too long until I’m back on that side of the world. On my return I had a crazy month catching up with family and friends, and although in some ways it felt like I had never been away, in others it was really strange adjusting to being back. 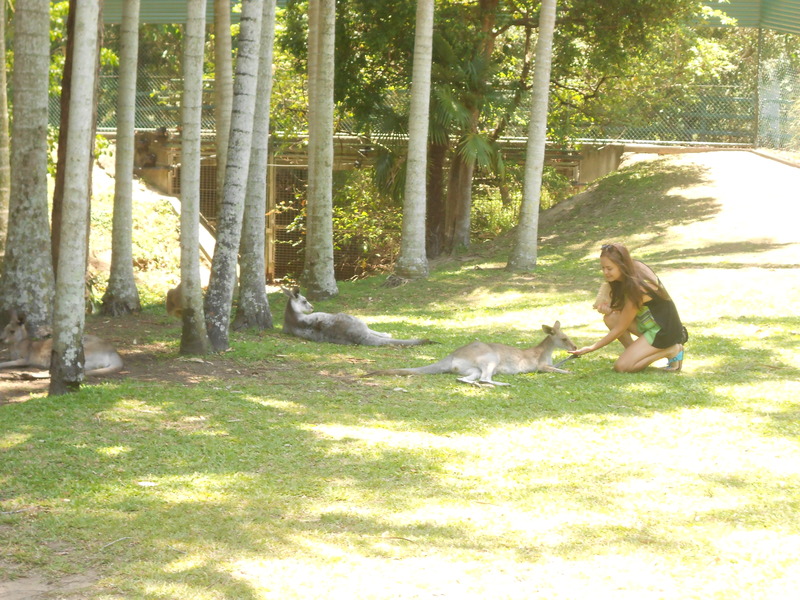 I was constantly asked ‘How was Australia? !’, and each time I tried to come up with a different way of trying to sum up such an incredible experience. Coming back to Manchester was equally surreal, catching a Magic Bus and being back on Oxford Road (even with the diversion!) really has felt so normal. I thought I would find moving back into a house strange, after a year of being in college and having all my meals provided, but in some ways it feels like I never left. I’ve now been back two weeks and had my first week of lectures, and am really starting to get my head around being in my final year of university. It was strange walking into lectures and only seeing a handful of faces that I recognised, as I am one of only six Psychology students who went abroad last year. However, us six have already bonded over sharing stories and it’s been fun sharing my experiences abroad with others in my new year group. It feels good to have my feet firmly back on the ground in Manchester and seeing what this year has to offer. This experience has definitely made me much more aware of the study abroad students who come to Manchester and what I can do to help aid their experience over here. Through the Global Friends scheme I have already met a few of them, and it’s really interesting hearing about Manchester from an exchange point of view. Even just helping them plan their travelling or where to find places around Manchester, I feel like I’m giving just a little bit back. Studying abroad was such an amazing experience for me, I’d really like to make sure incoming students to Manchester are getting the same experience that I had. It’s crazy that this time three years ago, a girl stood up in one of our lectures and told us about the opportunity to study abroad, and immediately I knew it was something I wanted to do. At that point, I never realised how much studying abroad would shape my vision of what I want to do next or how much it would benefit me. I feel really ready to take on my final year at Manchester and I already have lots of ideas of what I’d like to do after university – but maybe I should just get through this year first! Well, Sydney for new year was definitely something I’ll remember forever. 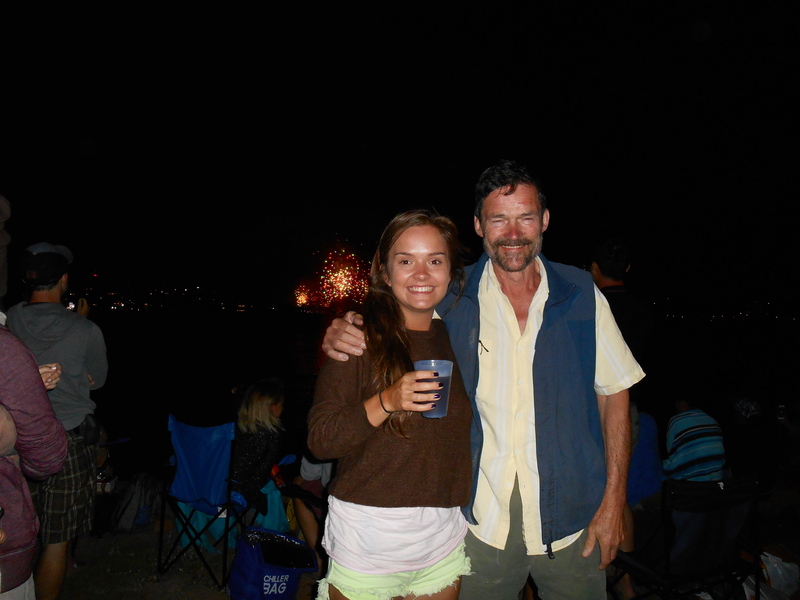 Dad and I joined some of my friends and found a spot on the beach appropriate for a good view of the fireworks. The new year was seen in sitting with a drink in knee high water watching the spectacular fireworks from the Harbour Bridge – wow. I’d definitely recommend adding that to the bucket list if you haven’t already been there for yew year. 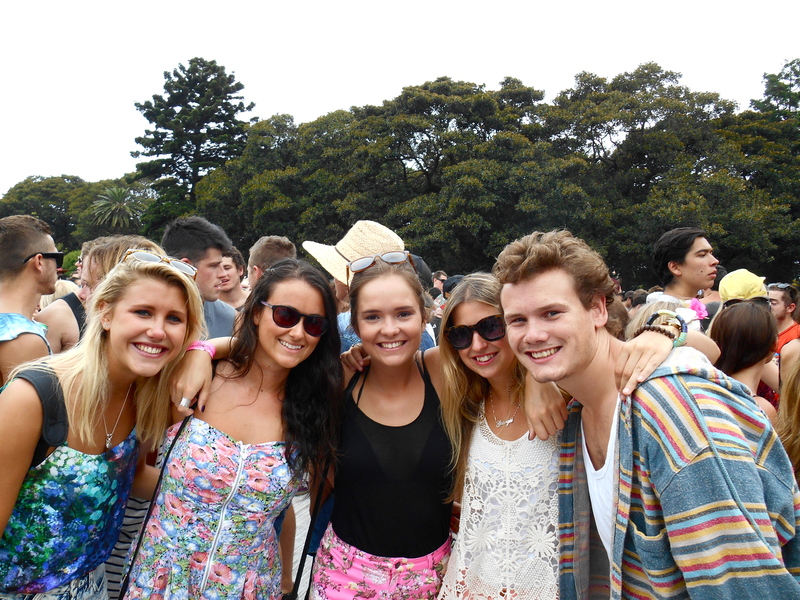 Also Field Day on New Year’s Day – festival next to the harbour, another fun addition to my new Year. The rest of our few days was spent being ‘proper tourists’ and taking the classic photos – Opera House etc, and a day on a boat on the harbour, taking in all the views from the water – something else I’d definitely recommend doing! 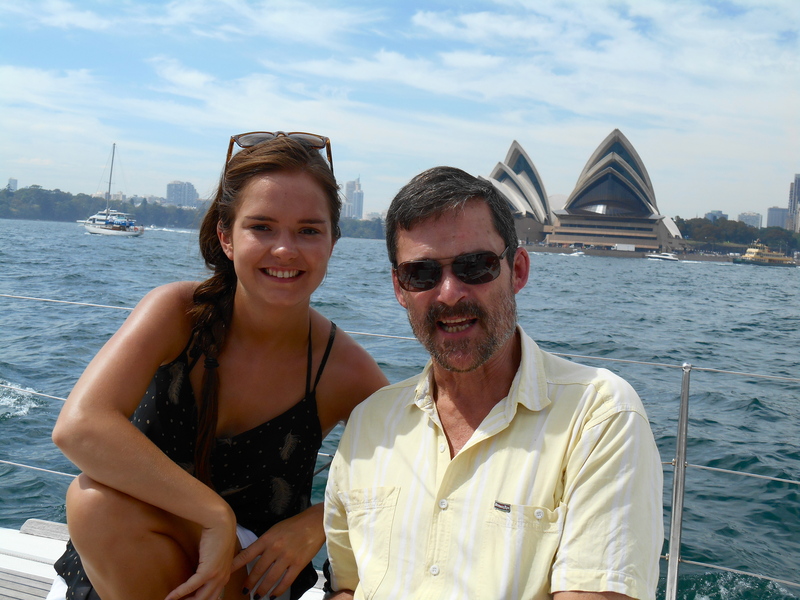 This felt like a good beginning to the father-daughter bonding holiday – five incredible days down, ten more to go. 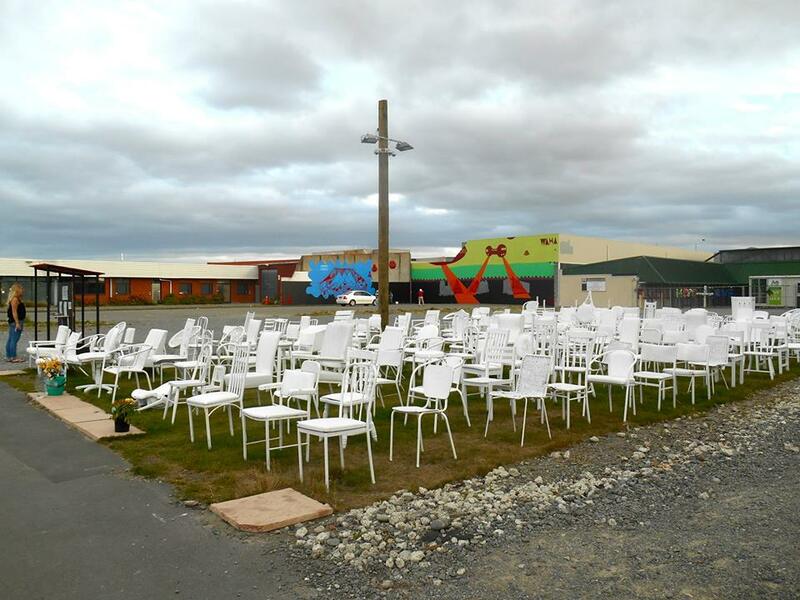 Next stop – Hawkes Bay, NZ. The next leg of my incredible summer holiday was to do the important family rounds. One of the reasons I wanted to study over this side of the world was to get a chance to see my family more often, and being with Dad seemed like the perfect opportunity. Flying into Napier I spotted my Uncle waiting to pick us up, and I knew I had arrived at my southern hemisphere home. Dad and I spent ten days making sure we saw every single member of my Mum’s (very large) family all at least once, without missing anyone out. 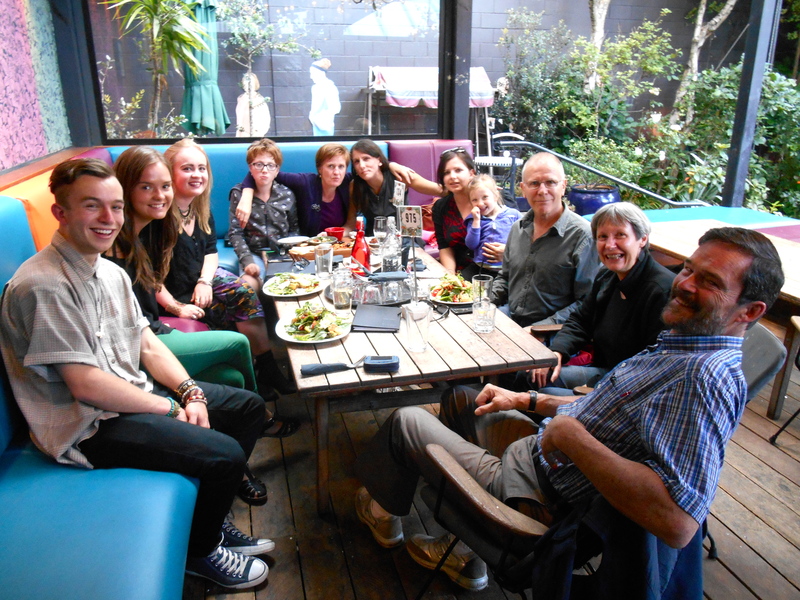 It has been lovely to catch up with everyone again, and we even managed to get there in time to help my oldest Aunt see in her 70th birthday! We broke the time driving between Napier and Hastings by taking a trip down to Wellington to see some more of the family that live down there in NZ’s capital, the ‘windy city’. 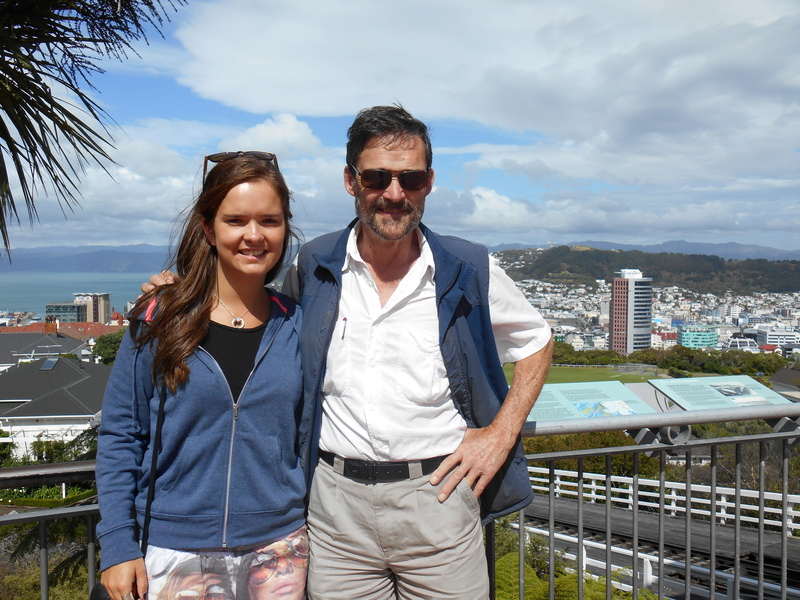 The ten days in NZ with Dad went by so quickly, and it was so sad to say bye to him – knowing this is the long stretch of not seeing anyone at home. 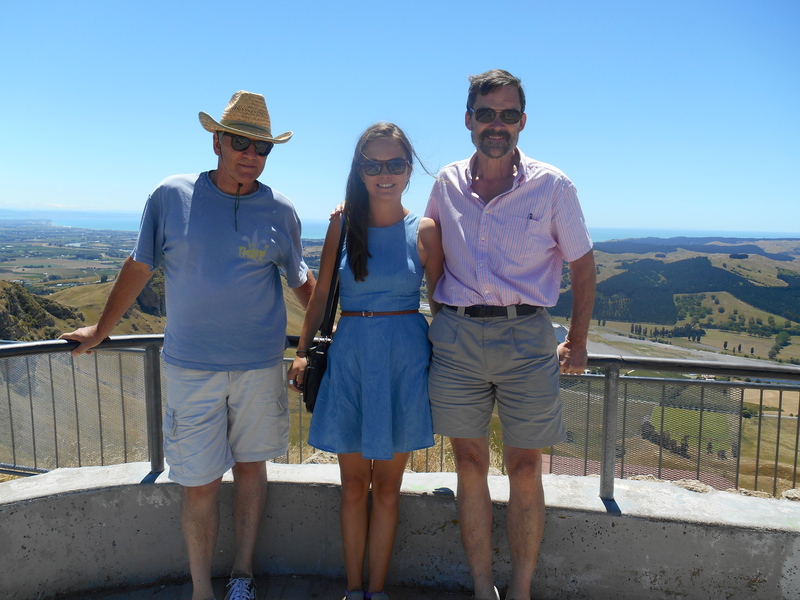 However for me, this was only the beginning of my NZ adventure, as while Dad hopped on his flight to America, I flew down to Christchurch to stay with my friend – also called Megan – and then to do the ‘Kiwi Experience’, the bus around the South Island. Having had so many trips over the years to see Mum’s family in NZ, you’d think I’d know the country pretty well, however because of the extent of the family we have to see we haven’t had a chance to see much of the South Island as well. Along with catching up with family I really wanted to use my amazing opportunity of being ‘down under’ for an extended period of time to see some of what the South Island has to offer. The South Island adventure began by staying with another Megan, an old friend who I last saw aged 16. 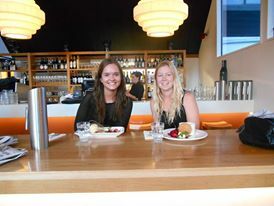 It was great to catch up with her, and also a great base for a good night’s sleep before ten days of hostels on the road! 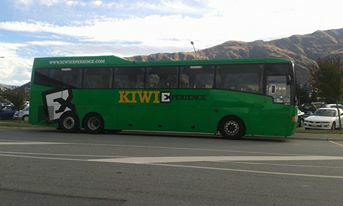 The beginning to my Kiwi Experience was definitely not the same as the ones others have recounted to me: I arrived at an empty bus stop, to get on a bus with one other girl, who I then found out was leaving the next day. We picked up some more people, and they were all leaving the next day too. It was quite a testing start to my solo travelling as I had to realise there was a chance I wouldn’t have a solid travelling group for my time in the South Island. If my spirits were dampened, however, then what better way to pick them up than by the opportunity to swim with dolphins when reaching Kaikoura – one of my definite items on my bucket list! With my minor fear of open water, and no one I knew at all doing it, it was definitely very testing for me. 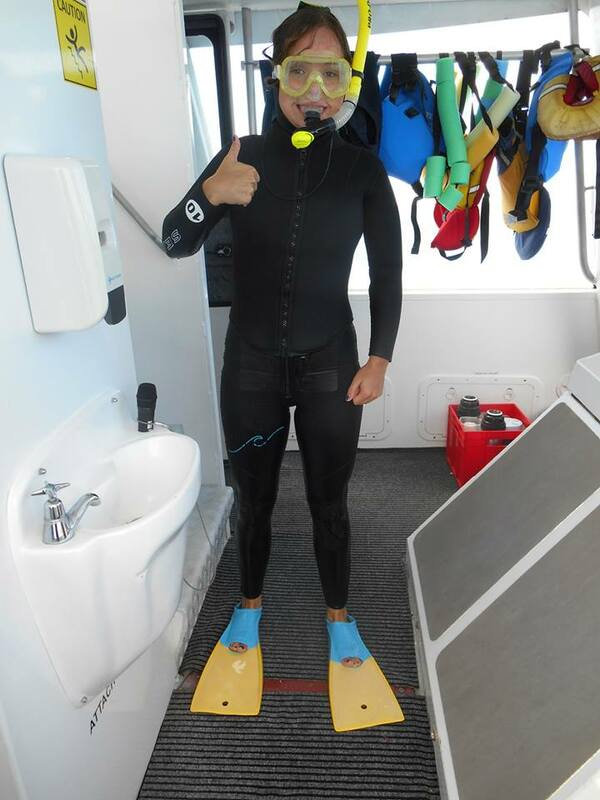 However, I got my wetsuit and snorkel on and was in for every drop in the sea for the same length of time as everyone else! – Needless to say I’m very proud of myself (normally I’m an in-out snorkeler). Swimming with the dolphins was incredible – at each stop there was literally hundreds of dolphins swimming around, all so inquisitive and within touching distance! Definitely an experience I will never forget. 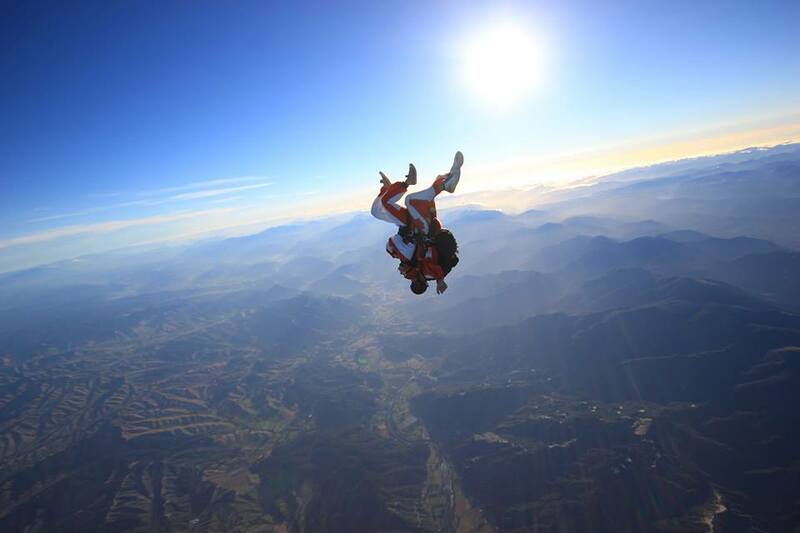 If that wasn’t an incredible start to my trip it was only about to get better – a 16,500 ft skydive (the second highest skydive in NZ) over the Abel Tasman National Park. After ticking off the water fear, the next one to test was my heights fear, however I coped pretty well. After harnessing and everything, the whole plane ride up I was so excited and it was only when the plane doors opened that the nerves started to kick in. It was probably the most incredible but surreal experience I have ever had and the views were out of this world. From this location you could see both the North and South island, the mountain range, a lake and the Tasman sea – just wow. I still found it pretty scary at points but the views and the adrenaline rush definitely took over! Just beginning to meet people that were doing the rest of the trip with me, it all stayed on a high. 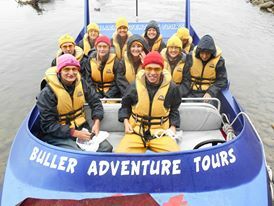 The jam-packed Kiwi experience meant that after a night in Kaiteriteri at the national park, the next stop was rainy Westport with a spot of jetboating on the way. Here we experienced just how lovely NZers are, when walking through the rain to find the local supermarket and a random woman offering to give us a lift to it. 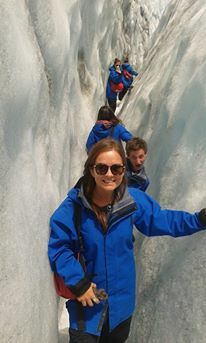 Next stop Franz Josef and the Franz Josef glacier – we had a helicopter ride onto the glacier and then spent the main section of the day having a guided walk on it, which was amazing. It’s incredible that within just a few hours you can surf on a beach, sit by a lake in the sun and then be on a snow covered glacier all wrapped up! From Franz we went to Wanaka and checked out the lake, and then onto the adrenaline capital of the world, Queenstown – I absolutely fell in love with Queenstown. After deciding not to do a bungey, way too scary and to save some of my money after a very packed few days, Queenstown was surprisingly quiet on the activity front for me, but I loved it. Set next to the water, within the mountains, I felt like I was in paradise. The views from the top of the gondala were out of this world and it doesn’t do too badly on a night out either! Cocktails out of teapots made me think of home, haha! 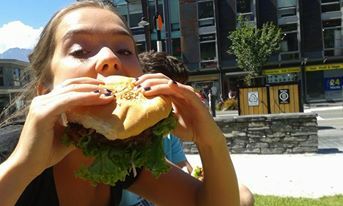 Probably the most important thing I did in Queenstown was eating a world-renowned Fergbuger. The hugest burger you’ll ever eat – a challenge for sure, especially if like me you picked a ½ lb burger by accident! The end of my time in Queenstown also meant leaving behind the three girls who I had spent the majority of my trip with as they were staying there to work, although the goodbyes were sad, hopefully they will come and visit me in Perth before they head home. Next it was just a quick stop off at Lake Tekapo for a night before heading back into Christchurch again for a couple of days with Megan to conclude my time in NZ. Having said goodbye to Megan I’m now on the way back to Australia, to the east coast to begin my road trip from Byron Bay up to Cairns – next stop Byron Bay for Australia Day! As I take off on yet another plane I thought I’d continue my tradition of using this time to update my blog. I went to see my friend PJ in Brisbane and had such a great time! I was welcomed by his lovely family who thanked me over and over for looking after him in Manchester – if only they knew it was often the other way round! Haha. 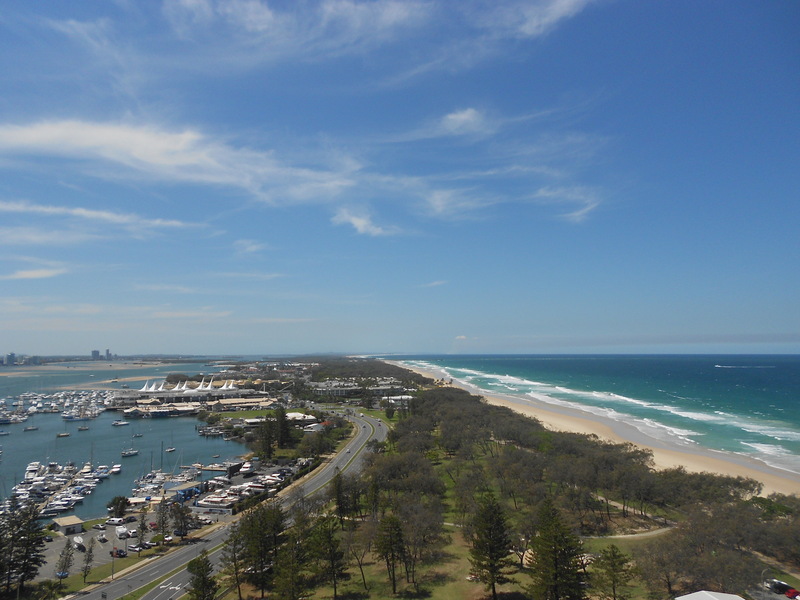 I was there for ten days and managed to see Brisbane, some of the Sunshine Coast annnnnd the Gold Coast in that time! 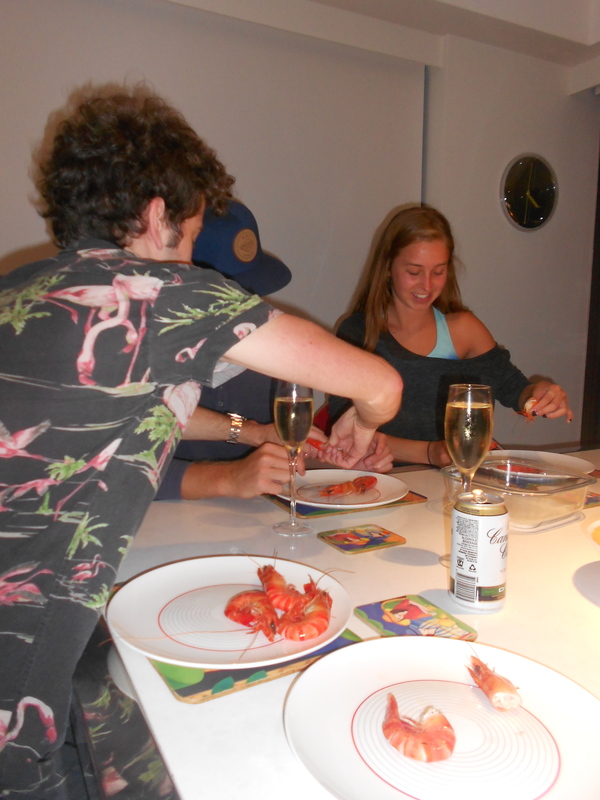 We spent a few days at the Gold Coast with a couple of my friends from Perth which was fun – and most importantly my two Perth friends (both American) and I had our first experience of ‘peeling prawns’ – a very useful skill to have in preparation for the upcoming Aussie Christmas! 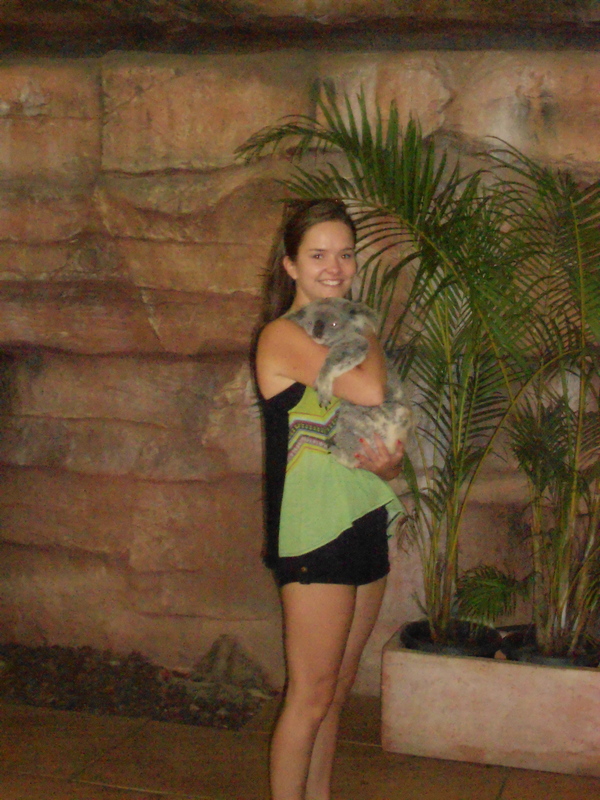 Another first I had whilst over in Queensland was I got to hold a koala – something I’ve wanted to ever since I arrived in Australia, and I did this at Steve Irwin’s famous Australia Zoo. 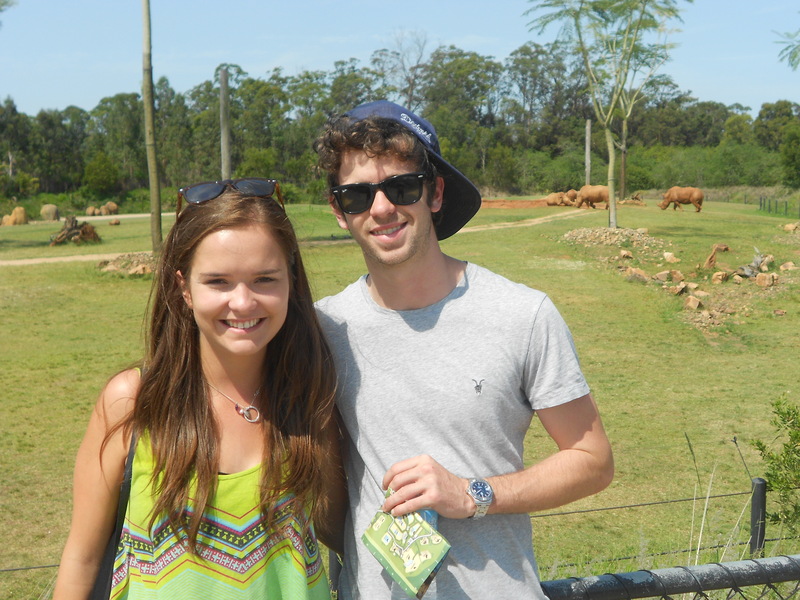 This along with the various crocodile shows and feeding kangaroos made for a great day! However probably the thing that stands out most from my ten days there was how often the use of the expression ‘get around it’ is used over there – the translation is something along the lines of ‘get involved’. 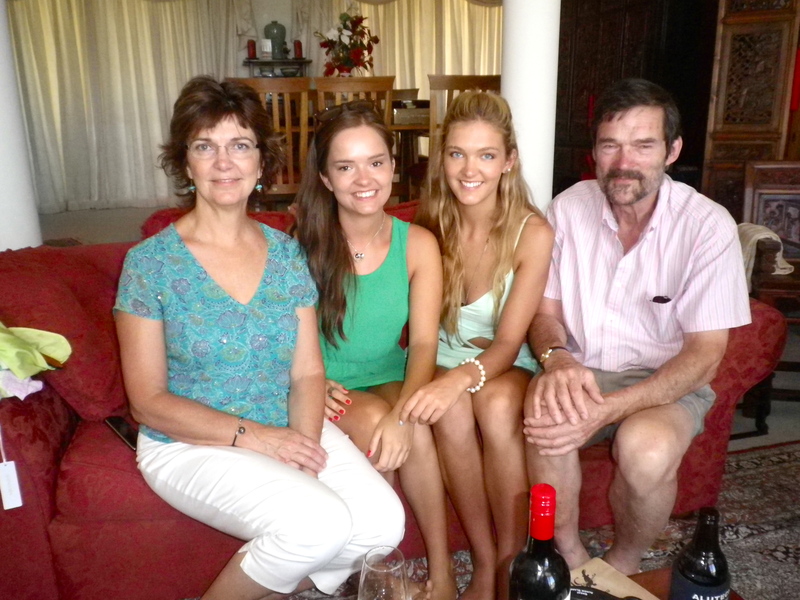 The end of my time in Brisbane welcomed the exciting arrival of my family in Perth – the long awaited reunion with my parents and my sister for Christmas which was so exciting! 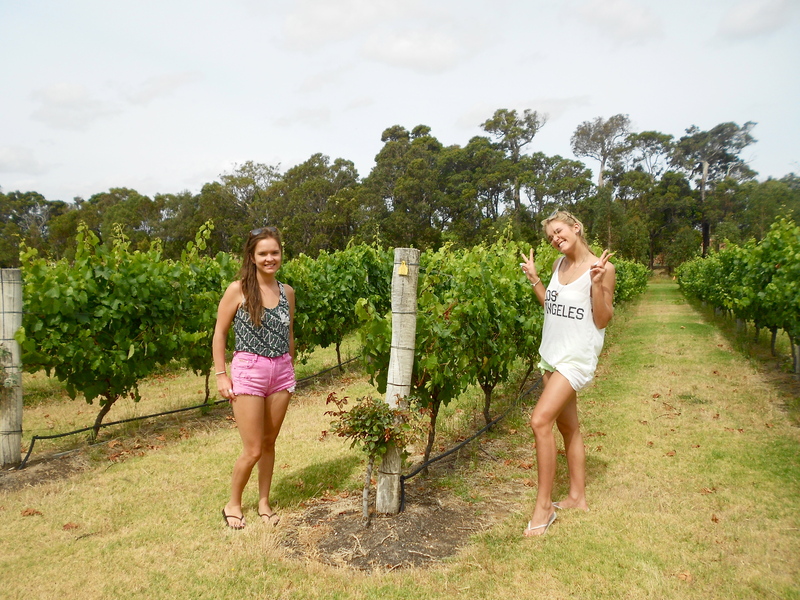 In the two and a half weeks that they were in Western Australia we spent time in Perth, down south in the Margaret River wine region and up north in the secluded Jurien Bay. Our time in Perth was in separate chunks between the two other trips, and spent showing them around college, university and all my favourite spots, and of course our first Aussie Christmas. Although not our first warm Christmas, as a couple of years ago we were in New Zealand with Mum’s family, it was our first ‘hot’ Christmas, spent in the 35 degree + heat and by the pool at a family friend’s house in Perth. 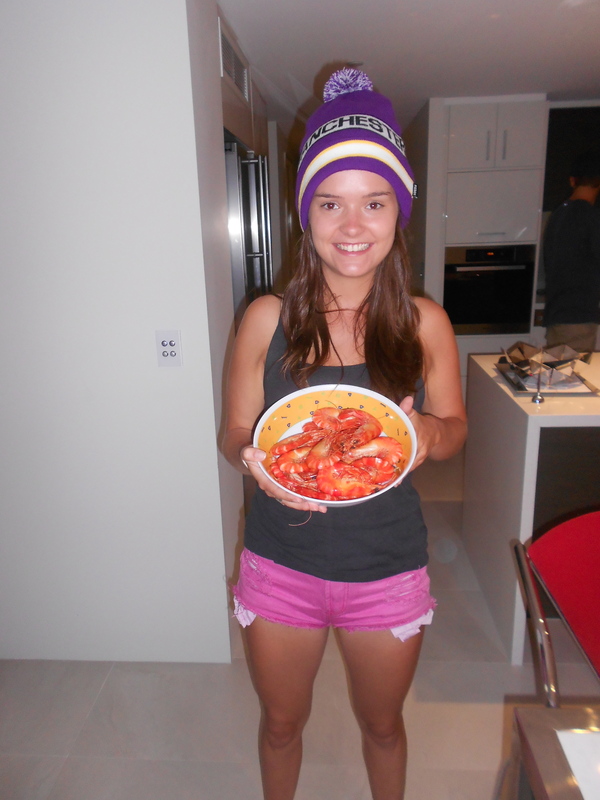 No Aussie Christmas would be complete without it’s seafood and we were spoilt on that front! 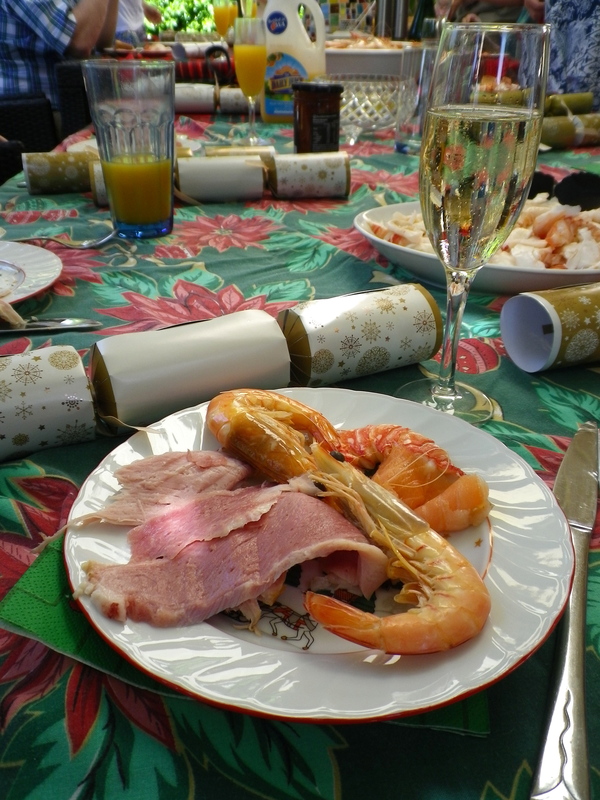 We welcomed in Christmas Day with a champagne and seafood breakfast in the glorious sunshine. The array of prawns (obviously! 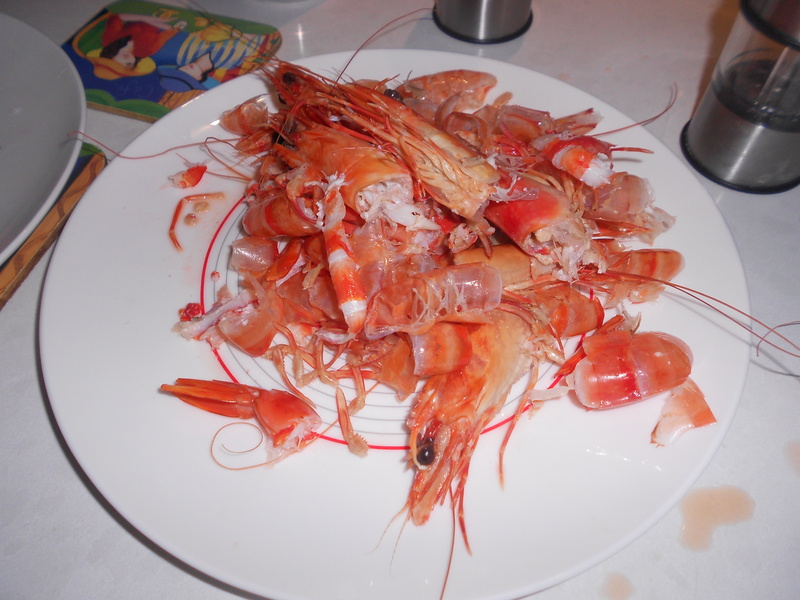 ), crayfish, smoked salmon etc was remarkable and we felt truly spoilt to be able to eat such fresh seafood. We ended breakfast saying we could definitely get used to all of that, and we should definitely find space in the Hitchcock Christmas for a champagne breakfast of this kind – I guess it won’t have quite the same effect sitting next to a fire in the freezing cold! After having our Aussie Christmas input the rest of the day actually followed fairly similar to our Christmas at home. 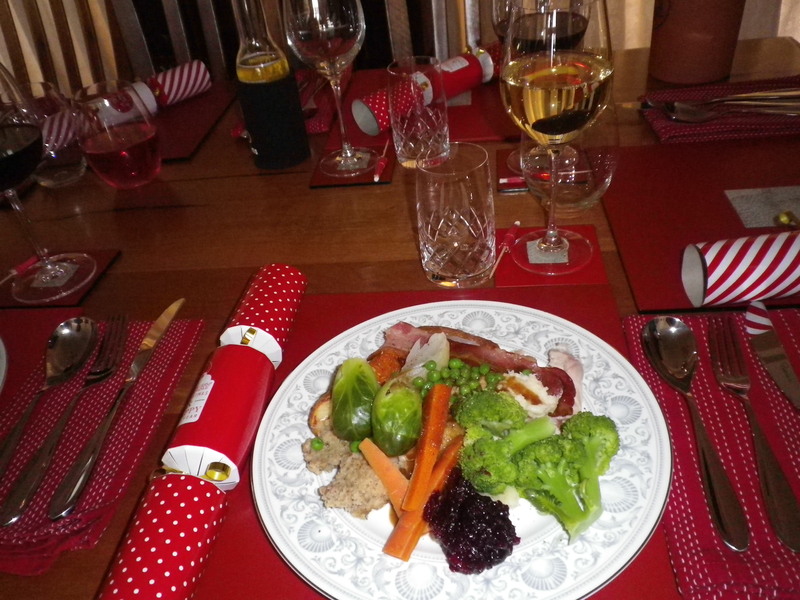 The friends, being British in origin have a ‘proper’ Christmas dinner – turkey, gravy and all the trimmings, which suited me very well – I’m not one to miss out on Christmas dinner. We had a great day and were very lucky being able to share the day with such a lovely family. Our trip down south allowed me to show my family an area outside of Perth that I had been to before. 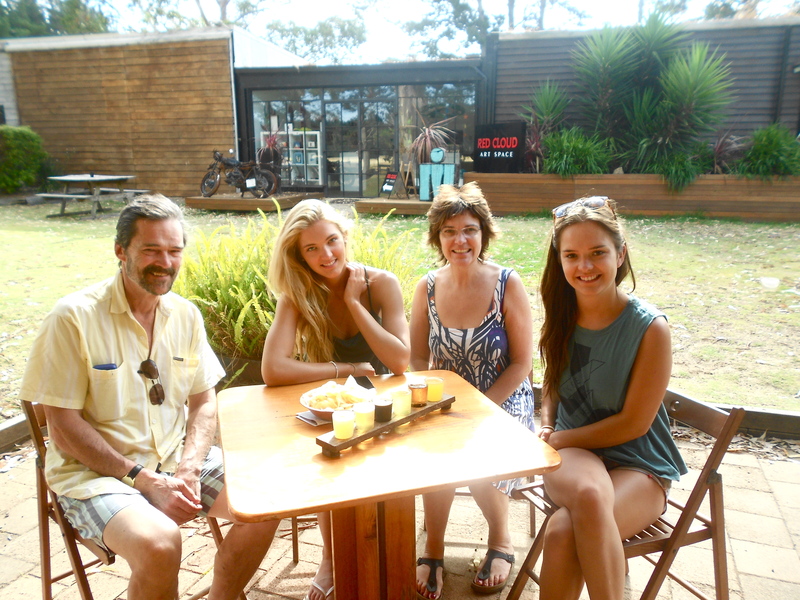 Our time was spent wine tasting, beer tasting, chocolate tasting and visiting some of WA’s finest beaches – life really is hard. 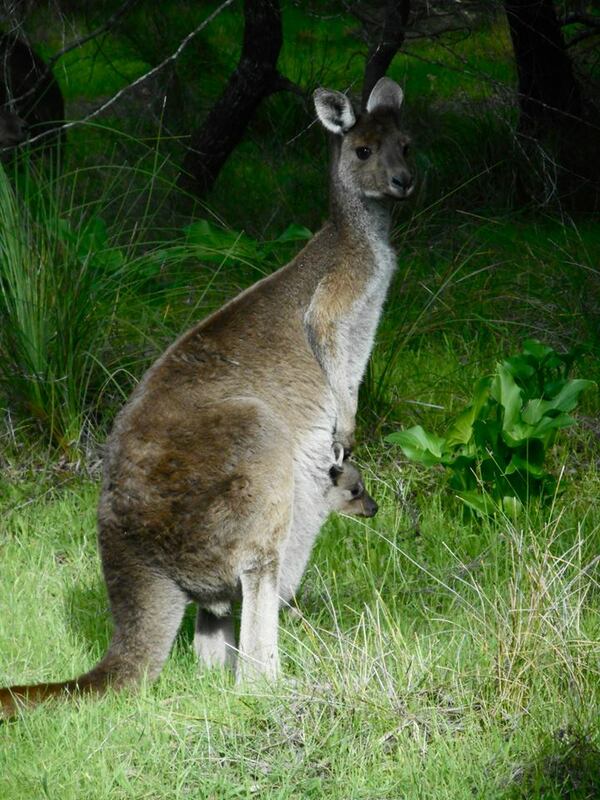 Yallingup gave the others their first sightings of kangaroos – wild kangaroos can be spotted whilst driving around, and with my sister having only just turned 18 a week before her arrival in Perth, being an all adult family now we really did ‘get around’ the wine tasting. 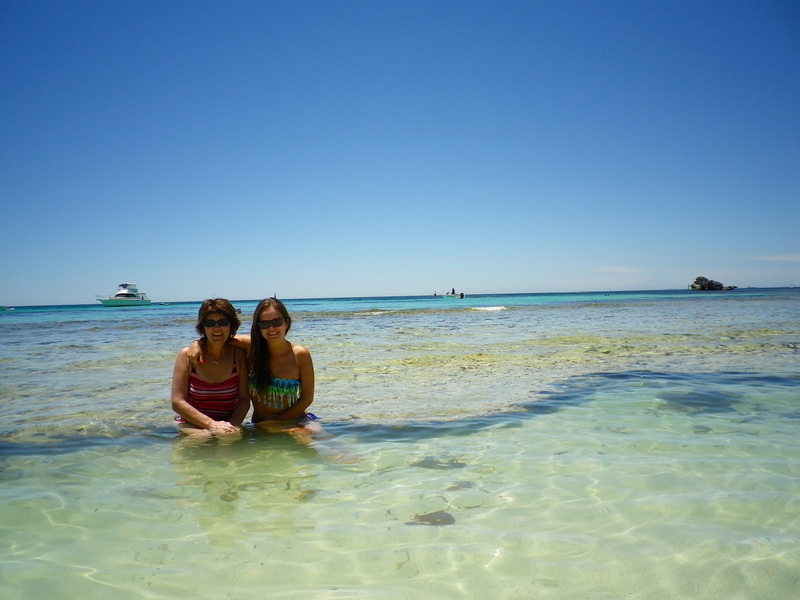 Not wanting to be travelling for too long outside of Perth, Jurien Bay seemed like the ideal place when going up north from Perth (only two hours drive), however on arrival didn’t turn out to be quite what we had planned. In booking to stay in the quiet seaside area, we had plans to do some watersports and a glass bottom boat trip, however we soon found out that in recent months these activities had been stopped by the appropriate governing body, so instead we spent some lovely time on (yet another) lovely beach and enjoyed getting to know the lovely family that owned the motel we stayed in, as well as a visit to the Pinnacles. 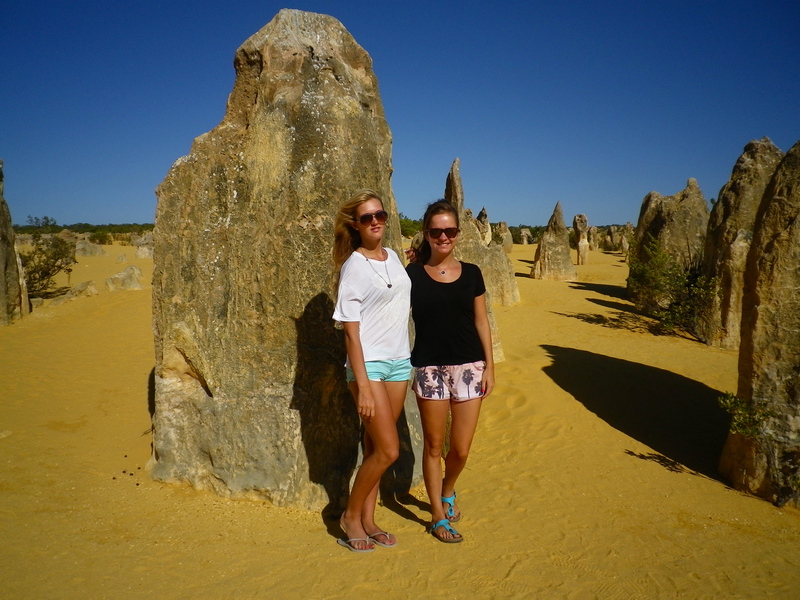 The trip also included a visit to a National Park where the family were able to see their first koalas, and to the Pinnacles, an interesting rock formation. Although today I said a teary goodbye to Mum and my sister for the long half of the year, I’ve held onto Dad, who being newly retired (ish) has decided to take an extended holiday. We are currently on a flight to Sydney to spend five days there visiting friends but most importantly to celebrate the new year in arguably one of the most spectacular ways, watching the fireworks on Sydney Harbour – excited is an understatement! After that we are heading to New Zealand to catch up with Mum’s family. With two and a half weeks together we definitely have some father-daughter bonding planned – watch this space and I’ll write again when I have some more news. I’m a week and a half into my three month summer holiday and I’m already on my third flight of the holiday. I can’t even begin to explain how much fun I’ve had! 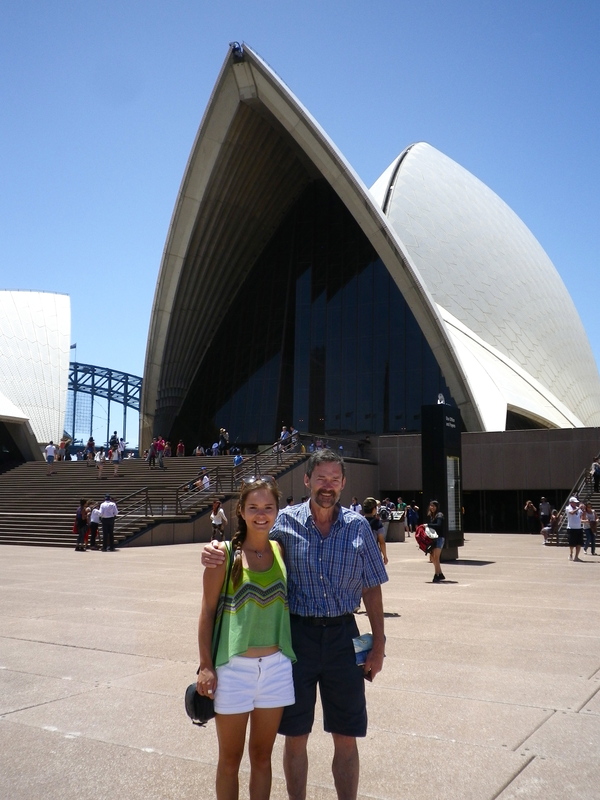 First stop Sydney – I spent nearly a week there and did so much! Sydney is definitely one of my favourite cities in the world and this week only emphasised that for me. 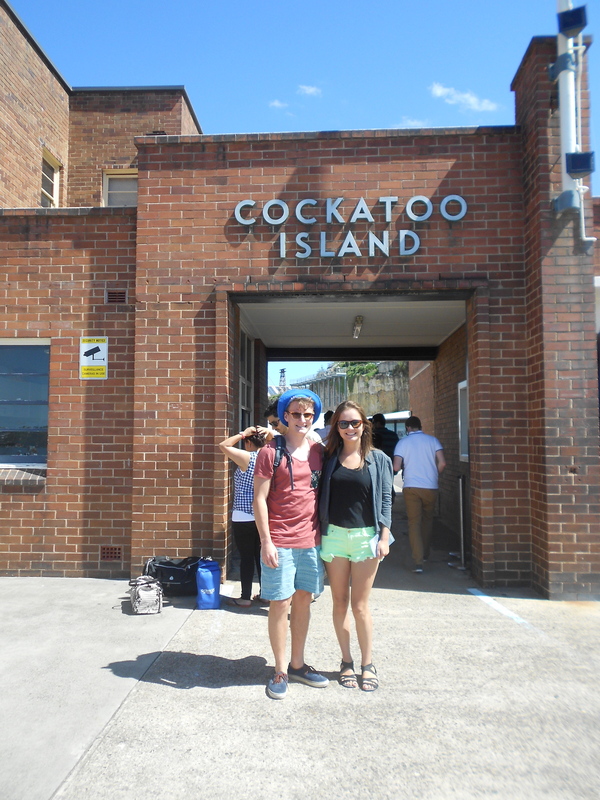 I spent my first day there at Cockatoo Island, an industrial island just off Sydney with a really cool outdoor bar that plays live music for the classic Aussie ‘Sunday sesh’. 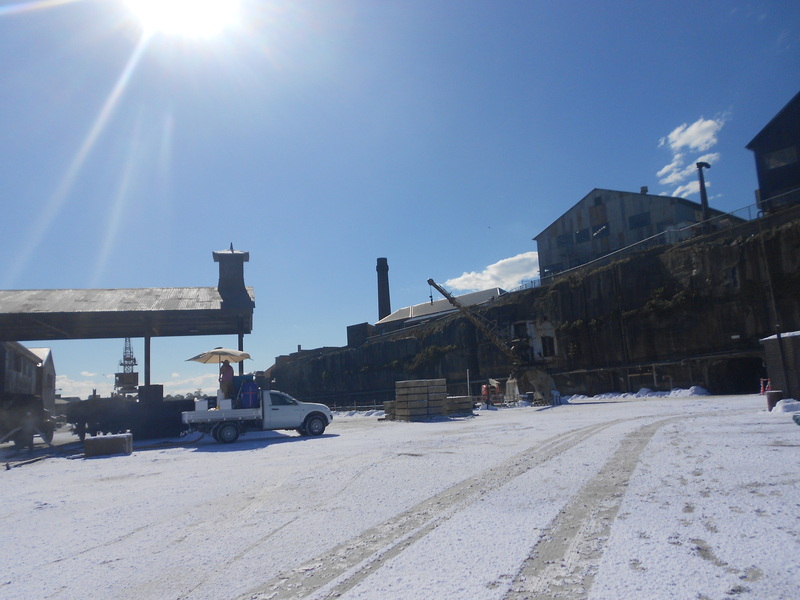 After chilling there, we walked around the island only to happen to walk through an area of fake snow and lots of building work going on – we had accidently walked onto the film set of the new Angelina Jolie film ‘Unbroken’ due to come out soon! 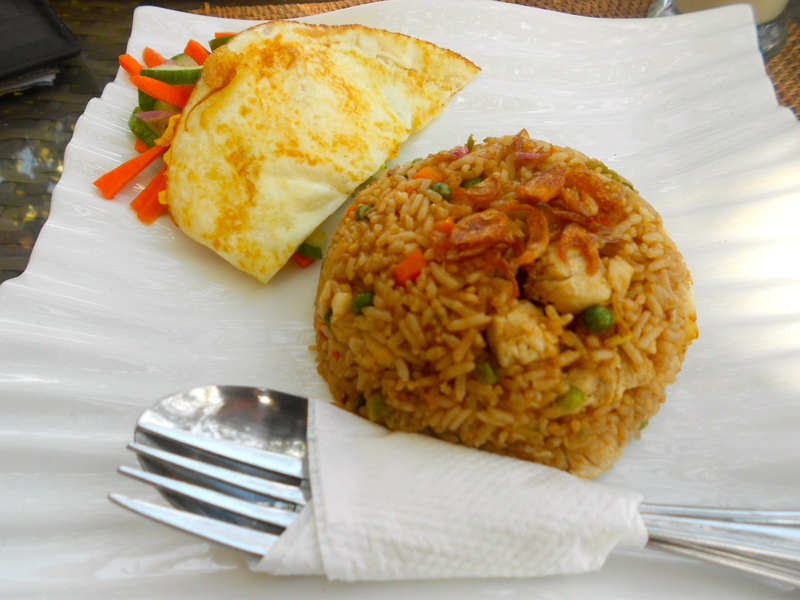 The rest of the week was spent chilling in the sun and enjoying the perks of not feeling obliged to eat college food! Sydney dining is definitely something worth experiencing! On Wednesday I caught up with a friend who I haven’t seen in five years who is now living and working in Sydney, which was lovely! 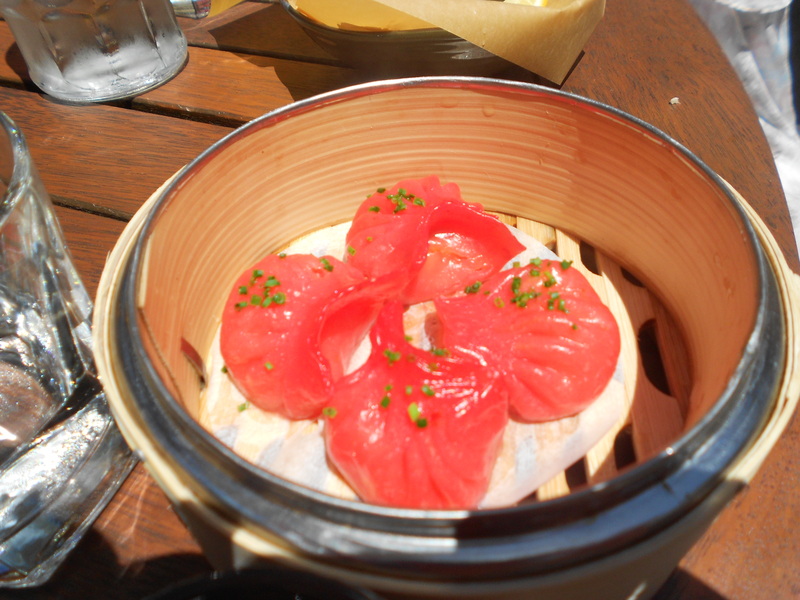 However being the ‘foodie’ I am, I managed to get a photo of the food we ate together (firecracker prawn dumplings) but not one of us, silly me! Something definitely worth checking out if you ever get the chance to visit Sydney is Sydney’s hidden pubs and bars – there are so many hidden away that you only know about through word of mouth. A couple worth mentioning were one that from the outside looked like an old launderette and then inside was a really quirky cocktail bar – great if you’re a gin lover like me, as their takes on the standard g’n’t are definitely something worth trying! 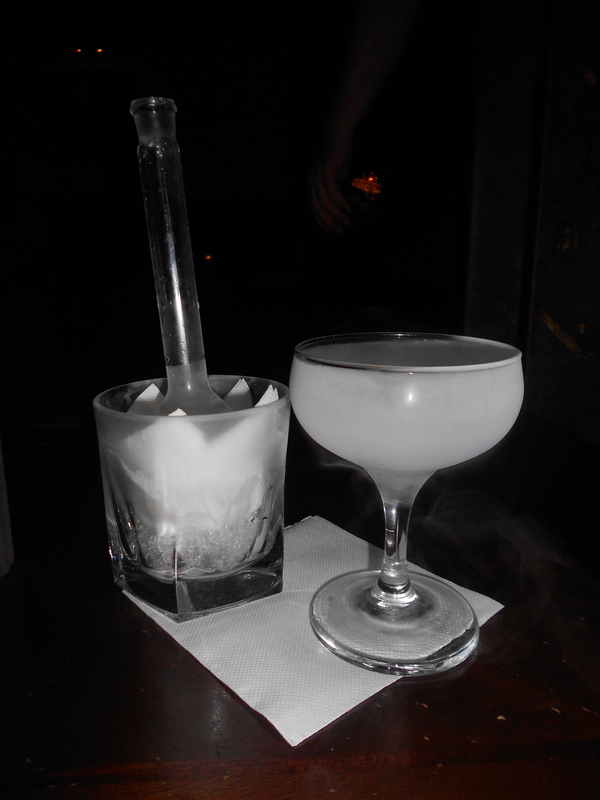 Another is behind the toilets of a very average looking bar, and then when you walk through you are suddenly in the 1920’s and feel like you are in an American Speakeasy – my first experience of a nitrogen cocktail there was also a great experience! 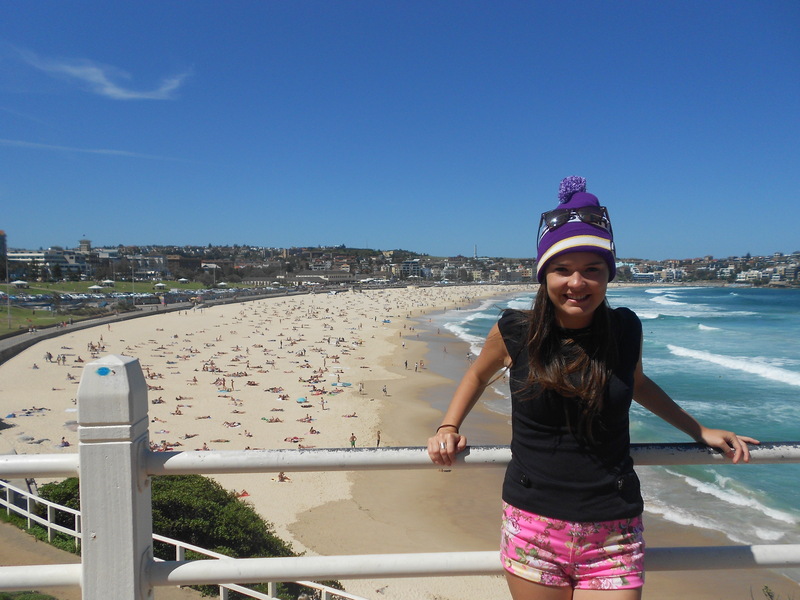 Even though I have been to Sydney before I felt obliged to make the trip that is a must for every Sydney tourist, and made a trip to Bondi. Don’t worry the essential walk along the boardwalk and a decent sunbathe was included, whilst I also managed to fit in my first photo with the Manchester hat – he is travelling with my for these three months so hopefully there will be more of those to follow! 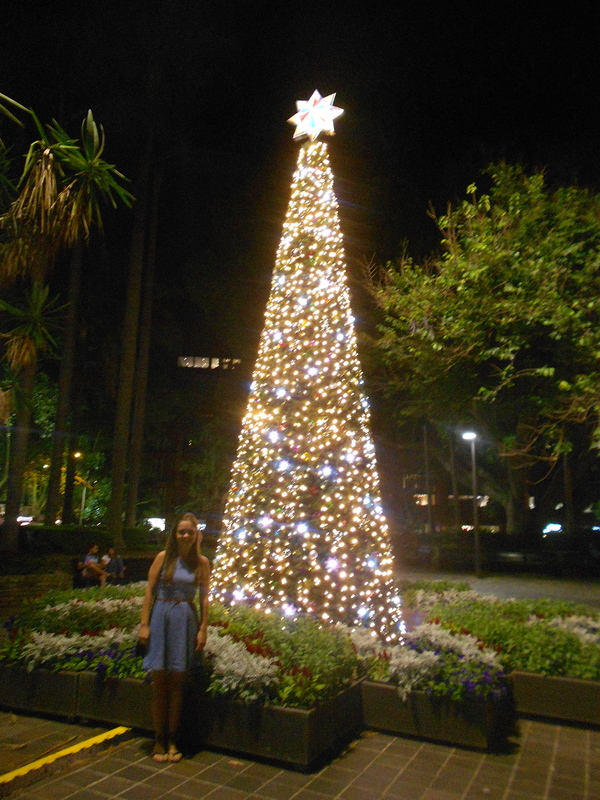 Sydney was also my first sighting of Christmassy stuff in sunny Australia – such a weird concept! Although my delayed flight at the end of my trip to Sydney was slightly frustrating, the week was great and I can’t wait to be there with my Dad again to see the spectacular New Year that Sydney has to offer! Next stop: Perth, for the weekend. 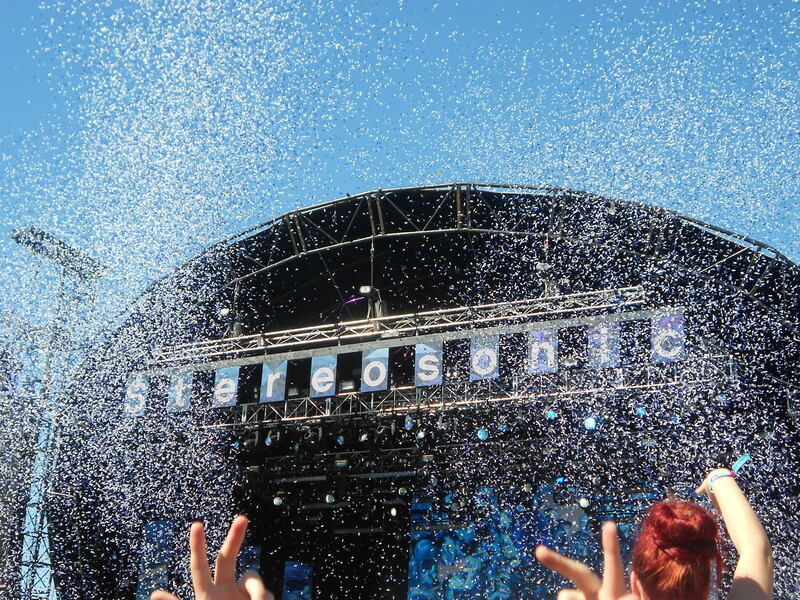 This sounds crazy I know, but due to poor planning I then went back to Perth for the music festival Stereosonic. Although I have to say that it had nothing on Glastonbury earlier this year, is was a great weekend and lovely to see the Perth girls again! Being in Perth, and it not being completely sold out I managed to make it to the very front for lots of the acts – watching Armen van Buuren from the barriers was definitely something I won’t forget for a while! The atmosphere was electric – my first experience of an Aussie festival definitely lived up to all expectations! This seems to be where I write my blog posts at the moment, but I am currently on the plane on the way to Brisbane – this is to see a friend who I met when I moved into halls in my first year of Manchester as he was on exchange from Brisbane. After a semester together he sadly flew home, and two years later we are finally going to be reunited! In the next blog post I will let you know how it goes! 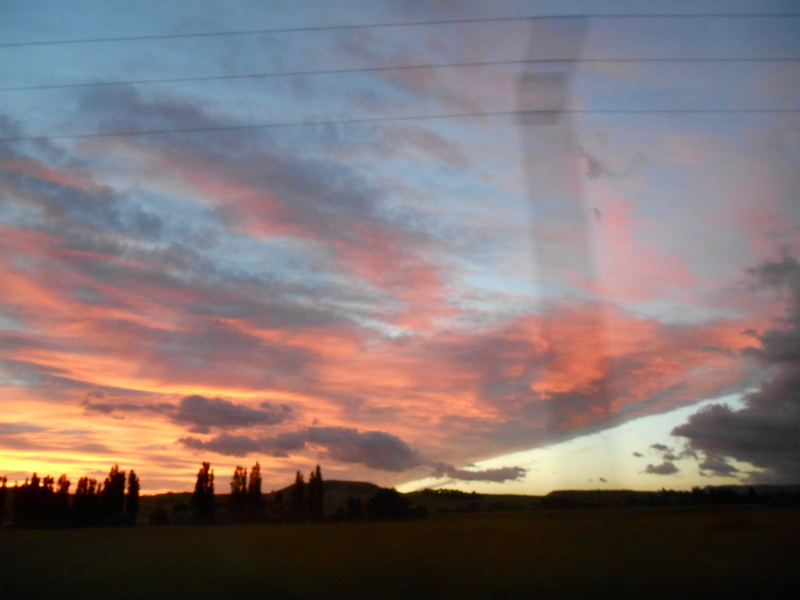 So since I last wrote I had to go to New Zealand unexpectedly, but other than that nothing too exciting has happened. As over here it’s the end of their academic year we had end of semester exams. I found it hard to get my head around the concept that I actually had to sit exams when it was 35 degrees + outside and the beach was calling! College suddenly became a lot quieter as people settled down to work and I found that revising wasn’t so bad after all! I’m doing aspects of psychology I really enjoy out here and am finding the content really interesting, which really helped when revising. 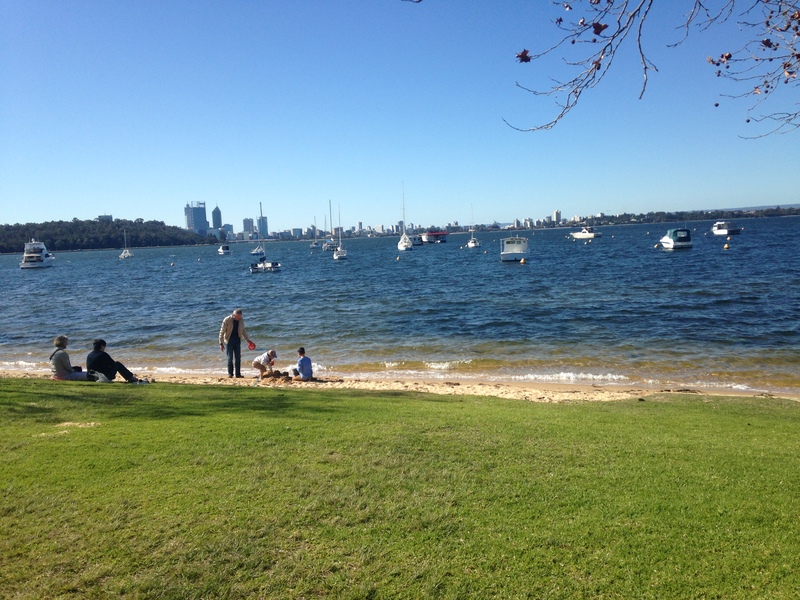 Some days I took my revision down to Matilda Bay, next to the famous Swan River in Perth, which was lovely – very different to revising in rainy Manchester! I found the exams easier than I expected, even though I’ve modules from faculties outside of psychology, so had to get used to a different style of writing. 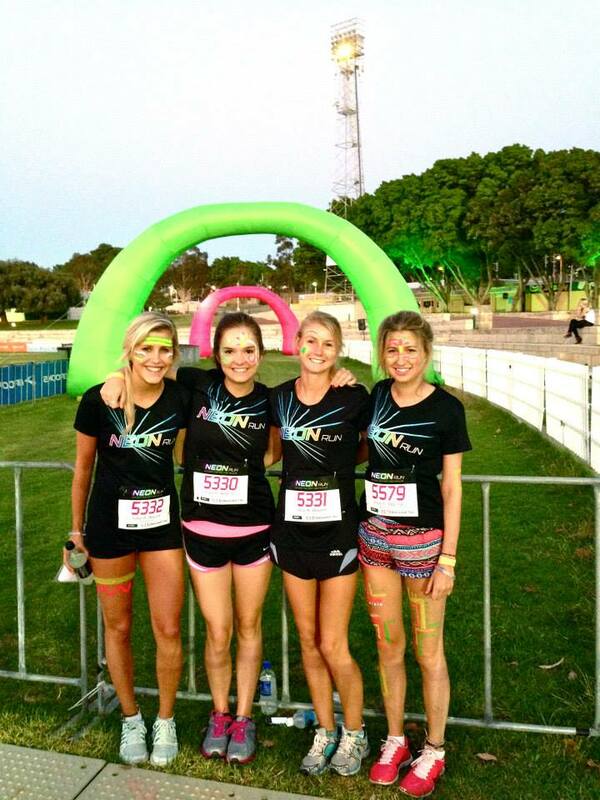 As a revision break, I signed up to do the Perth Neon Run – essentially a fun 5km run dressed in bright colours, with DJs playing and a party afterwards. For someone that never runs normally at all, I was impressed that I managed to get around the 5km, but for the friends I was with 5km was a walk in the park so I definitely had to make sure I kept up! As I was unlucky enough to have my last exam at the very end of exam period, the last week of revision had to be combined with packing up my room. As in college here it’s their big summer holiday so everyone (even internationals) have to move out of their rooms, even if (as I am), you are coming back next semester. Many would think that this would be a simple process as I’m an international student; I came on a plane so I can’t have that much stuff right? Wrong. Very wrong. After numerous hours of sorting through my stuff I managed to divide everything into three piles – one lot that I don’t want at all over the three month holiday which went into storage at college, another that I might want to access over the holiday whilst I’m in Perth, that went to my cousin’s who lives in Perth, and the third pile which is currently with me on the plane to Sydney. So after a LOT of sorting (I definitely do NOT know how to pack lightly!) I am beginning my three-month adventure with a trip to Sydney! It definitely feels like a holiday away from a holiday, but what I have in store for the next three months is definitely going to be pretty epic. First stop Sydney for a week, and I’ll keep you updated on what I get up to next! Sorry for not writing for a while, the last few weeks have been pretty crazy. Having decided that I had to start acting like a true ‘Aussie’ I decided what better way to do that then do what all Aussies, well most Perth Aussies do anyway, and make the all important trip to Bali. 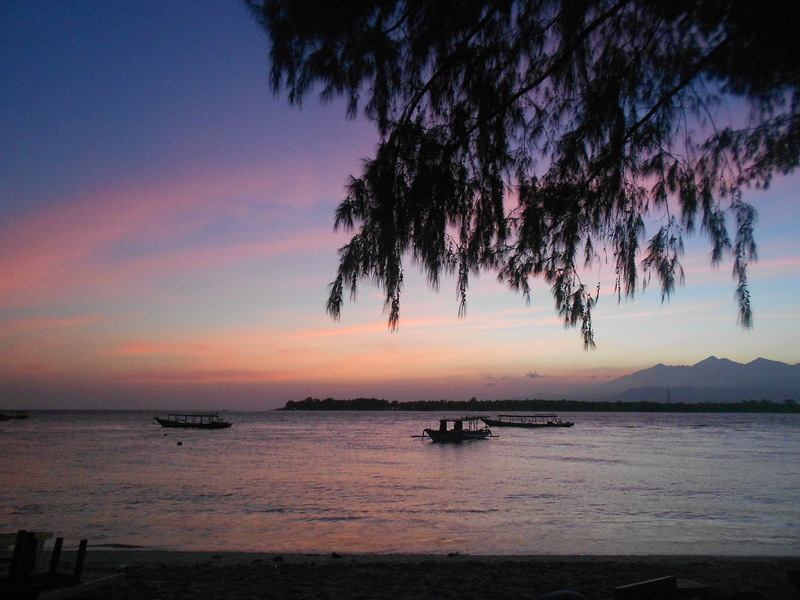 I spent my mid semester break in Indonesia (incorporating Bali & the Gili Islands) just over a month ago now, and wow it genuinely was ten days in paradise! Just when I thought the study abroad experience was getting that little bit too hard, and I just HAD to have a break, the postcard-like beaches, the clear blue sea, the massages, cheap cocktails and snorkelling with sea turtles really did seem like the fitting break I deserved… haha. I went with 8 other friends, all also on exchange, and had a great time. If I thought getting back to Perth was going to be in any way disappointing, I was proved wrong. In the weeks since my return from paradise I have been very busy with lots more fun things including ‘girls night’ and my college ball, both of which are a big part of Australian college life. Girls (and boys) night is a night which involves the girls from college going to an ex-residents girls house and the boys doing the same separately and then meeting up at the end of the night. It involves lots of antics including games and challenges and is generally a lot of fun. The theme for us girls was ‘LBD’ – Little Black Dress, so finding the perfect LBD at a little shop in Bali worked perfectly! After that, the next event was the college ball, and weren’t we in for a treat! 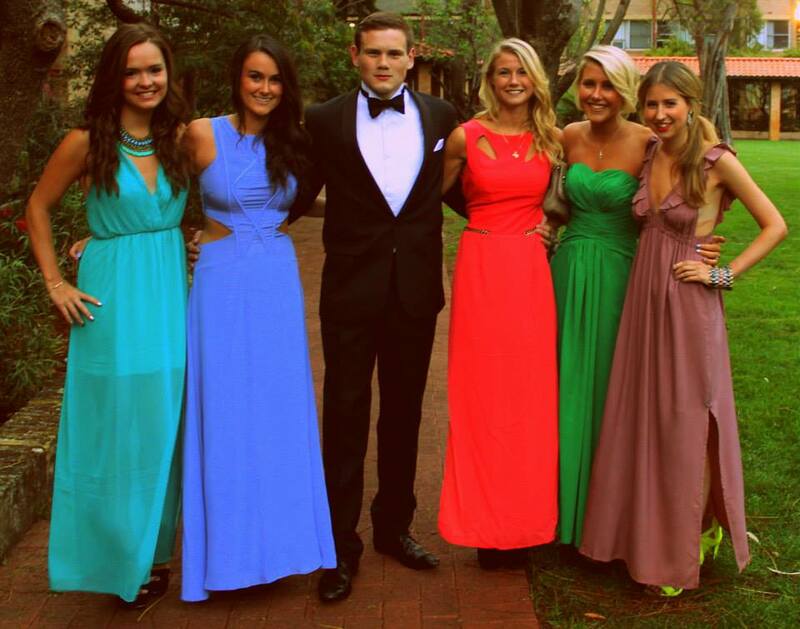 My my myyyy, Australian colleges really do know how to put on a ball! The night started with photos (of course) in our quad, with us all dressed up after hours of ‘ahhh what dress am I gonna wear? !’ and making sure no one was wearing the same dress and then we were off to the ‘secret location’. The location of this event was in no other than a restaurant on the 33rd floor of a skyscraper building in central Perth. With a 360 view across the whole of the beautiful city, and a revolving floor, it really was spectacular. The night consisted of a lot of champagne, an incredible 3 course meal, lots of dancing and lots of silly photos in the photo booth, before continuing the fun at an after party. I am still amazed at just how incredible the whole event was! To top off the frivolities for that week, the day after the ball was ‘recharge carnival’ at college – hot tubs, a bouncy castle and slush puppy machines, what a perfect way to recover! All in all if those few events were anything to go by – yes, college over here is pretty expensive but they do use every cent of money to make the whole experience worthwhile! Since then the fun has died down for a while, I’ve actually had a lot of uni work to do (which seems to surprise everyone at home) and so have had to focus on that. 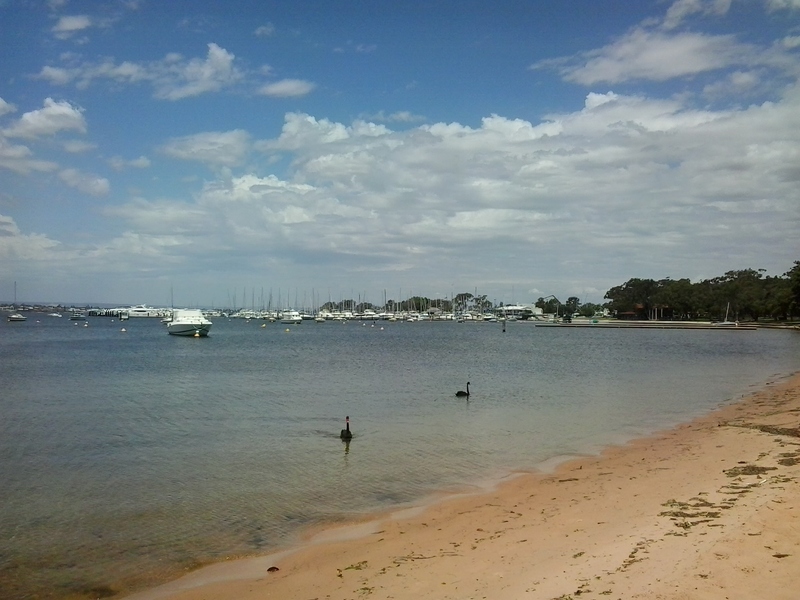 However, I have managed to have work breaks at the beach – life ain’t that bad! I have started a job babysitting for a local family two days a week, which I absolutely love. The kids are 3 months, 18 months and 3 years old, so definitely a handful but as the mum is around too, I’m just another pair of hands and someone new for the kids to play with! The 3 month old is just starting to recognise me, and now smiles when he sees me and starts to giggle – definitely a wonderful moment when that first happened. Other than that I’m just getting towards the end of semester and exams – scary stuff.